Haal af van rooster en laat koud word. Sit die gestopte worsies terug op die rooster totdat die spek bros is en die kaas gesmelt het. Fry on each side until done. .by Kos vir kampeerders met idees vir kampering on Wednesday, June 29, 2011 at 1:47pm. Maak burgers volgens aanwysings op pakkie gaar. Meng piekels, uie en tamatie met blatjang. Sny stokbrood oop, en plaas slaaiblare en `n stukkie vleis daarop. Bedien met `n goeie skeut salsa. .by Kos vir kampeerders met idees vir kampering on Tuesday, August 16, 2011 at 1:02pm. Pleks van die tradisionele maalvleiskoekie het ons sampioene in die rolletjies gesit. Verwyder die sampioene se stingels en hou dit in die yskas om later in sop of slaai te gebruik. Smelt die botter en roer die knoffel en pietersielie by. Smeer die bottermengsel aan albei kante van die sampioene. Geur en plaas met die stingelgedeelte na bo op 'n bakplaat. Bak sowat 20 minute in die voorverhitte oond. Draai een keer om. Haal uit die oond. Sny die rolletjies in die lengte deur. Druk die binnekant van die rolletjies in die pansappe en smeer dan 'n bietjie mosterd binne-in. Plaas twee sampioene in elke rolletjie en sprinkel 'n bietjie suurlemoensap oor. .by Kos vir kampeerders met idees vir kampering on Tuesday, August 16, 2011 at 1:19pm. ■Hamburger sauce (I bought this at the store to try it out, was pretty good, but a mix of Mayonaise and Chutney will be even better). ■Dried Onion chips (If you cannot find this, fry two real onions). 1.Braai the patties until medium turning 3 – 5 times in total. 2.Just before the patties are ready, after the last turn, place a slice of cheese on top of each so that the cheese can slightly melt. 3.Put a patty with cheese on the bottom half of each bun, and add all the other ingredients. 4.The order really does not matter, so go for something that will look good on photos. 6.In my opinion eating French Fries at home is really stupid and the time spent making them could be spent standing around the braai. 7. If you want to eat more, braai and make more hamburgers. .by Kos vir kampeerders met idees vir kampering on Friday, August 19, 2011 at 1:20pm. Mix all the patty ingredients together. Halve the rolls, and butter them. Stack the Rocket leaves and some caramelized onions onto one halve. Remove the patties form the oven and top with a slice of camembert. Return to the oven for a couple of minutes until the camembert melts. Remove from the pie tins and place on top of the onion rings with the camembert to the top. Cover with the other halve of the roll and serve immediately. .by Kos vir kampeerders met idees vir kampering on Wednesday, August 24, 2011 at 3:10pm. It's a big hit whenever it's served. This recipe can be done on the stove or over a fire. Pour beans in a baking pan or iron skillet. Slice hotdogs into 1/4-inch pieces and add to beans. Dice onions and add to beans. Add mustard, ketchup, and brown sugar. Stir until everything is mixed and cook about 30 minutes. .by Kos vir kampeerders met idees vir kampering on Wednesday, August 24, 2011 at 3:18pm. Take any bread mix. Be adventuresome and consider a bread with some flavor: one of our tomato breads or Sour Cream Onion or a rye bread or maybe Fully Loaded Baked Potato Bread. Mix the bread according to the package directions or recipe. If you are using your bread machine, set the machine on the “dough” setting so that the machine will mix your bread for you, let it rise and then beep when it is time to bake. If you are making bread the old-fashioned way, let the bread rise in an oiled bowl as you would for other bread recipes. Remove the dough and divide it with a knife into eight equal pieces if you are using a one-loaf mix. Form a round with each. Place them on a greased baking sheet with room to expand. Using the heel of your hand, flatten each roll. The elasticity in the dough will tend to make the rolls spring back. Let the dough relax for a few minutes and repeat the process. Cover the rolls with plastic wrap and let the rolls rise until doubled—an hour or so depending on the mix and the room temperature. If you care to put sesame seeds or poppy seeds on your rolls, mix one egg white with one tablespoon of water. Just before baking, brush the mixture onto the tops of the rolls and then sprinkle with seeds. The egg white will keep the seeds in place. You can bake nearly anything with a covered grill. The heat rises and circulates in the covered area just as it does in your oven. The heat source can be charcoal, gas, or even wood. We prefer gas because it is easier to control and does not impart a smoked taste to the bread. Since it is hottest near the flames, elevate the bread even if you have to improvise. In our grill, there is a secondary shelf for baking potatoes and such and that works perfectly for baking bread. Grills tend to not circulate the hot air as well as ovens. To keep the bottom of the bread from burning, place one pan beneath the other and a wire rack between the pans to create space for insulation. The trick to baking buns on the grill is controlling temperature and time. If your grill comes equipped with a thermometer, you've got it made (though outside temperatures and winds may impact how well your grill retains heat). If you have a thermometer, just heat to 350 degrees. If not, guess. After a few experiences you'll have it perfect and we bet that the first batch off the grill will be just fine. Your buns will probably bake in 15 to 20 minutes. An occasional peek to see how your bread is doing as it nears completion is okay. ■Bake your rolls before the burgers. They can cool while you cook the rest of the food. Burning grease in the bottom of the grill makes the temperature harder to control and the soot can stain the bread. ■If you are letting your dough rise outside where the temperature may be less than indoors or where breezes may swirl around the dough, consider using a large food-grade plastic bag as a greenhouse. Simply slip the bread dough--pan and all--inside the bag, inflate it slightly, and close it. If the day is cool, set the bag and the bread in a sunny warm place to capture a little solar energy. ■If your buns are baking faster on one side than the other, turn the pan 180 degrees part way through the baking time. ■The tendency is to burn the bottom of the buns. Place the buns as far away from the flames as you can even if it means elevating the buns. .by Kos vir kampeerders met idees vir kampering on Monday, 26 September 2011 at 11:23. 2.Spice the chicken breasts with your favourite chicken spice. 3.When the coals are ready braai the chicken breasts until medium (about 10 minutes) and fry the bacon in a pan on the fire or in a pan on a stove. 4.Assemble the burger as follows: Salami, feta, chicken breast, mozzarella, bacon. (The chicken and bacon will melt the mozzarella, thus logic dictates that you can also assemble it: bacon, mozzarella, chicken, feta, salami). ■If you use good quality salami and bacon it will make the burger taste even better. ■Chicken breasts dry out easily when overcooked. Combine Hellmann's Mayonnaise, salt, pepper and cayenne in large bowl with fork. Stir in cheese and roasted peppers. Cover and refrigerate at least 30 minutes. Originally we wrote this up as eight secrets. We've discovered a few more. Remember these secrets for your next patio party and you'll have great burgers. 1. Start with the right meat. Buy your meat from a butcher you trust. Avoid the lean and extra lean burger which is great for casseroles but too lean for burgers—you need the fat for flavor and juice. Your meat should be fresh. Ask the butcher when it was ground and avoid meat that was not ground in the last few hours. 2. Don't handle the meat unnecessarily. Too much handling makes for tough burgers. Break a section of meat off and form the burgers with as little handling as possible. If you are mixing seasonings into the meat, toss the meat gently with your fingers to disperse the seasonings. 3. Make the burgers the right size. Remember, they shrink while cooking. Three-quarters of an inch thick on the edges and slightly thinner in the middle is just about right for most of us. A hamburger press like our Burger Buddy is a nice way to form burgers without handling them too much. Make the burger thicker than necessary and then gently press the center to form a concave patty. 4. Start out with a clean, well-oiled grill. Burnt food particles will taint your burger and make it stick. 5. Cook at the right temperature. You want your grill or pan to be at medium high, hot enough to sear the meat and seal in the juices. 6. Avoid the urge to press. Yes, you see others pressing their burgers with the spatula but doing so forces the juices from the meat. Again, it's the juices that make your burgers moist and flavorful. 7. Turn ‘em once. Years ago, I worked a grill in Alaska. The chef taught me to never turn the steaks more than once—doing so lets the juices run out and dries out the steak. The same goes for a burger. 8. Avoid the urge to overcook. A well-charcoaled burger is going to be tough and dry. That same chef taught me to tell how done a steak was by poking it with my finger. (The meat becomes firmer as it cooks.) You can do the same with burgers (and chicken). After the first cookout, you'll be pro. No more over-cooked burgers or burgers torn apart to see how red they are in the middle. 9. Season your meat before cooking. You'll find that your burger will taste much better if every morsel is seasoned, not just the outside. Add 3/4 teaspoon salt and 1/4 teaspoon pepper to every pound of burger and knead it in gently. 10. Cook your burgers on medium high heat. You want to sear the burgers, make a bit of a crust, and seal in the juices. Too high and you'll burn the outside before the burger is done; too low and too much of the juice will drip out. 11. Try mixing grated cheese into the meat for cheeseburgers. You'll get a burst of cheese in every bite, the cheese won't drip down into the grill, and it takes less cheese to make a cheesy burger. These are the ten best burger toppings that we settled on from our virtual tour of the best U.S. restaurants and from the burgers we made in our test kitchen. The names have been changed to protect the innocent. The pictures are our own. The salsa and fresh avocado make this a south-of-the-border delight. It's topped with bacon, Monterey jack cheese, and of course--avocado and salsa. Any burger with sprouts reminds us of the Good Earth Restaurant in Minnesota that we enjoyed so much. This burger is topped with cheddar cheese, sprouts, tomato, and avocado on a whole wheat bun. We experimented with pesto on a burger. This one was excellent with mozzarella cheese and our own basil pesto. Ah, with freshly grilled pineapple, this reminded us of our time in the Islands. We splashed the burgers with our own Teriyaki Madness sauce (but you can use something else from the store) and topped it with grilled pineapple, cheddar cheese, lettuce, tomatoes and mayonnaise. The grilled pineapple balanced the kick from the teriyaki nicely. This burger is dedicated to those who could eat a burger for breakfast. A fried egg atop a burger—that sounds like a breakfast food. In addition to the fried egg, this burger is topped with Colby cheese, lettuce, and tomatoes. We have two Emilys: one in production and one in fulfillment. It seemed like we should dedicate a burger to them. And who wouldn't like a pizza burger topped with pepperoni, mozzarella cheese, slices of tomatoes, red onions, lettuce, and basil-olive mayonnaise. We made the basil-olive mayonnaise with a half cup of mayo, a quarter cup of diced black olives, and a half tablespoon of dried basil. This sauce was a great discovery. 10. We went back to the caramelized onions that we like so much for this one. And yes, when you caramelized red onions, they're still red. We used this recipe for caramelized onions but used red onions and apple cider vinegar instead of the white wine vinegar. 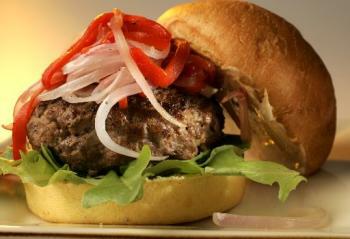 Along with the caramelized red onions, add mozzarella cheese, lettuce, and mayonnaise to your burger. Draai spek om worsies en braai tot gaar. Sny brood in groot stukke en halveer. Sit 2 worsies per broodjie met die mosterd en tamatiesous. Vir ‘n alternatief kan jy die brood vervang met ‘n lekker gebakte aartappel vir elke persoon. Heat the oil and saute the onion with the red pepper until soft. Add the garlic and stir-fry for another minute. Add the paprika and white wine and set aside to cool. Marinate the meat in the cooled marinade for at least two hours or, preferably, overnight. Remove the steak from the marinade and fry it in the olive oil, in a hot frying pan, until done to your preference. Season with salt and freshly ground black pepper. Remove the meat from the pan, keeping it warm. Sny 'n lendeskyf in blokkies. Sny knoffel op en druk in die vleis. Braai die vleis in botter. Drie minute aan elke kant. Haal uit en hou warm. Braai uie wat in skywe gesny is in die pan tot sag. Gooi witwyn in en kook af tot dik. Sit die vleis terug en kook tot warm. Bedien op Portugese rolletjies met aartappelskyfies. HEAT oil in large nonstick skillet. Sauté onion 3 min. until tender. Heat oil in large nonstick skillet until very hot. Cook steak pieces 5 minutes until browned, turning once; remove from skillet. Sauté onion in same skillet until tender. Add barbecue sauce and Worcestershire. Heat through. Spoon saucy onions on bottom of rolls, dividing evenly. Arrange 2 to 3 pieces steak on bottom of each roll and top with 2 slices cheese. Close rolls. Braai die ui in die olie en margarien totdat dit goudbruin en gekarameliseer is. As jy die proses wil versnel, gooi bietjie suiker by. Hou eenkant. Hier kom jy nou by 'n vurk in die pad – erg tradisioneel sou sê dat jy al die bestanddele apart op die worsie in die broodjie sit, en ek sou sê dat dit lekker is om alles te verhit en te meng . Gebruik dieselfde pan as vir die uie, en gooi die soetrissiesous, mosterd en agurkies in. As dit vir jou baie sterk is, en jy alreeds van die pad begin afwyk het, gooi mayonnaise by. Roer terwyl jy dit stadig verhit. As alles gemeng is en dit warm is, is dit reg. Skep nou die sous bo-op die worsie in die broodjie en skep gebraaide uie bo-op. Hierdie hotdog oortree die grootste reël – die een wat sê "geen tamatiesous"! Dalk weet hulle net nie hoe lekker dit is nie! Dit is regtig vinnig om te maak, en kan gemaklik in grootmaat gemaak word. Die beste is dat dit met enige worsies werk – tot die wat vreeslik goedkoop is! Kry 'n pan. Of 'n pot. Gooi al die nat bestanddele daarin. Verhit oor 'n lae temperatuur. Sodra dit warm, gemeng en gesmelt is, gooi die worsies by. Roer totdat die worsies deurwarm is en goed met sous bedek is. Dit moet sommer lekker lyk en ruik! Sny die broodrolletjies oop en sit nou 'n worsie met ekstra sous in elkeen. Braai in warm olie tot deeg gaar is. sny repie cheddarkaas en druk in die gleufie en volg die resep verder. I can’t believe I let summer pass by without posting about my favorite beef hamburger recipe. This is my go-to recipe that I use to make a bunch of hamburgers that I keep in my freezer to make for a quick and easy dinner. Since many people still grill outside well into fall (and you can make these on a grill pan or your broiler as well) – you can’t let this recipe pass you buy. The texture and taste is improved so much by a few simple ingredients and steps – you will never just throw a bunch of beef into a round patty and slap it onto a grill again. Enjoy! 1. Mash bread and milk in large bowl with fork until homogeneous. Stir in salt, pepper, garlic, and steak sauce. 2. Break up beef into small pieces over bread mixture. Using fork or hands, lightly mix together until mixture forms cohesive mass. 3. Divide meat into 4 to 6 equal portions. Form into a loose ball and then gently flatten into a 4 1/2 inch patty. Press center of patty down with fingertips until it is about 1/2 inch thick, creating a slight depression in each patty. Repeat with remaining portions of meat. 4. At this point – either freeze for future use or cook on a grill or stovetop. VRAAG: HOE KAN EK SAPPIGE HAMBURGER FRIKKADELLE BAK, WAT NIE UITGEDROOG IS EN SOOS SAAGSELS PROE NIE??? ANTWOORDE ONTVANG VAN ‘EGAFRIKAANS’ LESERS! Bak frikkadelle in die oond op 180ºC tot mooi bruin, gooi ‘n klein bietjie water in die oondbak dat frikkadelle nie uitdroog nie. Ek bak ook my hamburger patties in die oond, dit kom heerlik sappig uit! Ek sou dink jy moet 'n deksel of ' foelie oor die houer plaas dan sal dit nie uitdroog nie. Kook die patties met bietjie water en margarien in ‘n pan en wanneer gaar braai bietjie in die botter. Die water kook gewoonlik weg en die patties is dan nie droog nie. Dit werk vir ons. My ma het vir my ‘n heerlike frikkadel resep gegee. ‘n pakkie bruin uie sop en ‘n koppie mayonnaise per 500g mince. Bak dit soos normale frikkadelle in die oond. Dis heerlik en sappig – en BAIE maklik. Laat weet my wat jy daarvan dink! Met die Frikkadelle is dit baie maklik; ek vat 'n halwe blikkie tamatie en uie smoor en gooi water by dit en gooi dit dan daaroor... dis BAIE lekker en hou die frikkadelle lekker sappig! Bedek frikkadelle met foelie en bak ongeveer 1 uur tot die frikkadelle gaar is.Verwyder die foelie 10 minute voor die baktyd verstreke is. Die eenvoudigste manier is om in te rasper 'n groterige 'courgette' or wortels, dit is ook baie lekker as jy n ryp piesang plat druk en dit by jou vleis mengsel sit. Pak die bolletjies in 'n bak, gooi dan 'n sousie oor so halfpad teen die frikkadelle op, maak toe met foelie en bak. Haal die foelie af so 15 minute voor die tyd sodat dit mooi bruin raak. bief, hoender/groente, 'n bietjie rooi wyn, Worcestershire sous of bruin sous, lepeltjie gemengde speserye, moenie dit te dik maak nie want dit verdamp 'n bietjie tydens die bak tyd. Daar is dalk mense met beter raad as ek, maar ek sit die patties en frikadelle in ‘n oondpan, trek dan foelie oor die pan en maak dit so gaar. Steek net so paar gaaitjies in die foelie. (nie te veel) Dan bly die vog binne en hulle word lekker gaar. As dit gaar is, haal die foelie af en laat sit die rooster aan. Laat braai net so vir 2-3 min to bruin. Dis dan nog sappig binne. Ek maak my frikkadelle gaar in water en as dit gaar is maak ek baie sous (met Bisto) en gooi dit by die frikkadelle. Dan maak ek mash aartappels en gooi ook van daardie sous oor 'n sny brood en kaas bo-op!! Wha-la LEKKER!!!! As jy van ronde frikkadelle praat, ek braai dit altyd 'n bietjie sodat dit mooi bruin rondom is, braai die uie apart en dan sit ek dit terug in die kastrol waarin ek dit gebraai het en voeg bietjie water by, en tamatiesous, Worcestersous, wat ook al jy van hou, en as dit gaar is verdik ek die sous met 'n kwart pakkie brown onion soup of 'n bietjie bisto. Die gekoopte patties is maar altyd taai, omdat dit nie regte vleis is nie, maar met die regte sous kan dit nogal lekker wees op 'n hamburger. Ek dink ek was op laerskool toe ek laas frikkadelle in koolblare gehad het. En ek weet nie hoekom ek nog nie self my hand hieraan geslaan het nie, want dit is eintlik verspot maklik om te maak, en iets anders as die gewone. Maak jou frikkadelle soos jy altyd jou frikkadelle maak. My ouma het altyd plaas-vleis gebruik, en soetsuurdeeg beskuit se krummels. Dis hoekom haar frikkadelle altyd ‘n wenner was. En dis hoekom ek hare uit ‘n honderd ander sou kon uitken. Om die komberse vir die frikkadelle te maak, neem jy ‘n kop kool, en haal die blare een vir een af, totdat jy genoeg blare het om die balletjies mee toe te draai. Om die kraakvars blare egter meer hanteerbaar te kry, kook jy ‘n pot water, en blansjeer die blare daarin. M.a.w. jy maak dit papper en meer buigbaar. Haal dit uit die water, laat effe afkoel (jy wil nie blase van blare kry nie) en dan draai jy die frikkadelle daarin toe. Pak in ‘n gesmeerde oondbak, en as almal knus le, sit jy tinfoelie bo-oor, en druk in die oond. Die kook proses gaan afhang van hoe jy dit gewoonlik doen. Niks nuwe truuks met hierdie dis nie. Jy kan wel 2/3 deur die kook proses die tinfoelie verwyder om die blare bietjie kleur te gee. En siedaar - jou dis van ‘Ou Anties in Ko’berse’ is reg vir die tafel! Meng alles goed saam en vorm bolletjies. Bak in vooraf verhitte oond van 180 grade Celsius tot gaar. Marineer sampioene vir 3 uur in Franse slaaisous. Meng al die vulsel bestanddele en skep in die gemarineerde sampioene. Sit voor op 'n bed bros kropslaaiblare. 2. Meng nou die beesvleisaftreksel daardeur terwyl jy dit goed klits. 3. Kook saggies vir 10 minute tot die meel goed gaar is. 4. Week die gelatine in water en knyp dan die water daaruit en voeg dit by die saus. 5. Voeg suurlemoensap met die kruie by en meng goed. 6. Voeg fyngesny vleis by en bring aan die kook en sodra dit kook direk van stoof neem. 7. Meng nou die room en eierdooiers deur die vulsel. 8. Laat die vulsel koud word, terwyl jy dit af en toe roer dat daar nie 'n kors op vorm nie. 9. Smeer die bolaag van vulsel in met olie en laat dit 'n nag of 'n paar uur in die yskas staan. 12. Diepbraai die "bitterballe" vir 5 minute by 180*C. tot hulle mooi bruin is. Dien op met mosterd of mayonaise. Metode:1. Meng die uiesoppoeier met eier en laat dit 'n uur staan. 2. Maak frikkadelle en bak hulle gaar in botter. Eet met aartappelskyfies of brood met 'n vars groen slaai daarby. Dit word weer winter in Suid-Afrika. Die gereg is goedkoop en gesond en net die regte ding op 'n wintersdag. 1. Meng maalvleis met alle maalvleisbestanddele goed deurmekaar. 2. Sorteer ui en knoffel in botter tot glasig. 3. Bak maalvleis korrelrig met ui en knoffel. 4. Voeg die tamaties, paprikapoeier en beesvleisaftreksel by en kook alles tot dit gaar is. 5. Voeg gaar groenboontjies daarby en as nodig maak jy dit verder op smaak met sout, peper en aromat, laat alles bietjie verder deurkook tot alle smake goed vermeng is. 6. Doen maalvleismengsel in 'n oondskaal en verdeel die sneeu-aartappels daaroor. 7. Maak met 'n vurk 'n mooi kartelpatroon en verdeel die paneermeel met kaas daaroor. 8. Bak in oond by 220*C vir 'n halfuur of tot goudbruin van kleur en goed warm. Gee daar 'n lekker groen fris slaai by. Week brood in water, druk oortollige water uit en krummel. Voeg vleis en geurmiddels by en vorm dun, plat koekies. Sif droë bestanddele saam en meng tot 'n pasta met eier. Voeg net genoeg melk by om 'n loperige beslag te vorm. Doop vleiskoekies in beslag en bak tot goudbruin in warm olie. Rys. Vleis. Aartappels. So is ons, of meeste van ons, grootgemaak. En ek is trots op die kos van my herkoms, maar soms, net soms, dan vergryp ek my aan sushi of sterk geurige kerries uit die Ooste. Daarom is daar niks verkeerd met die opsaal van ‘n perd van ‘n ander kleur, as hy in jou kombuis wei nie! Sit af na die naaste spesery winkel, en kry vir jou fyn komyn, koljander, garam masala, ster anys, kaneel stokkies, mostert saadjies, swartpeper korrels, fyn chillies, kardomom sade, naeltjies en kerrieblare.Dis jou voorraad vir die winter. Met die basiese geure kan jy droomkos bou. En ‘n vysel en stamper is amper net so belangrik soos VARS knoffel, alhoewel ek dink laasgenoemde is ‘n kort-kop voor. In jou vysel en stamper gooi jy: ‘n stukkie skoon, vars gemmer (so ‘n sentimeter stukkie), ‘n vars knoffelhuisie, ‘n kwart ui, ‘n paar korrels swartpeper, en ‘n halfteelepel koljander en ‘n naeltjie. Werk die inhoud tot ‘n fyn pulp. Die naeltjie, en swartpeper moet sommer goed fyn wees, en die geure ingemeng met mekaar. Verhit olie in ‘n pot of pan, en gooi ‘n teelepel mostert saadjies in. Voor hulle soos popcorn begin spring, draai die hitte laer, en skep die inhoud van die vysel en stamper in. Dra ‘n voorskoot! Roer en braai die mengsel so 5 minute. Gooi maer maalvleis in - 500 g. En braai tot bruin/gaar. Skil ‘n groot aartappel of 2, sny in klein blokkies, en gooi by die maalvleis. Bedek met water, sodat ‘n gedeelte van die aartappel in water is, en die ander deel bo die water. Gooi ‘n half teelepel fyn chillies by, ‘n teelepel komyn, ‘n teelepel garam masala en ‘n ster anys en kaneel stokkie. Woeste geure wat nou begin trou in daai pot. Soos die aartappels gaar raak, sal die sous afkook en verdik. Hoe langer die dis kook, hoe lekkerder is dit. Ek gooi sommer ‘n stingetjie saffraan in vir kleur, maar ‘n teelepel borrie poeier is net so goed. Haal die ster anys en kaneel stokkie uit,geur met sout en ‘n plat teelepel suiker, en bedien op basmatiese rys of koes-koes. Versier met vars koljander blare as jy dit in die tuin het. Anderdag kan jy weer rys, vleis en aartappels eet, maar vir nou sit jy terug, en geniet die vreemde geure op jou tong.En as jy skugter is vir sterk kos, wees ligter op die chillies! Meng maalvleis, koue water, sout, peper. Kook vinnig sonder deksel, tot vloeistof weg is. Skep maalvleis in 'n bak. Smeer blatjang oor, Strooi rys oor, Strooi sop oor, dan sampioene en laaste kookwater. Sit deksel op of foelie. Bak 1 ½ uur by 180° C.
Verwerk die spek in ’n voedselverwerker tot fyn. Skep in ’n bak en voeg die maalvleis, ui, gekapte pietersielie, broodkrummels, eiers en geurmiddels by. Meng dit goed met jou hande en vorm in ses ewe groot bolle. Druk dit effens plat, pak op ’n plat bord en verkoel vir minstens 30 minute. Verhit ’n bietjie olie in ’n swaarboompan en braai die vleiskoekies daarin tot goudbruin en deurgaar. Smeer die hamburgerrolletjies met botter en sit slaaiblare, ’n paar skywe tamatie en ’n skyf kaas bo-op elkeen. Sit ’n warm spekvleiskoekie bo-op en rond af met ’n skeppie soet rissiesous of blatjang. Sit dadelik voor. Jy kan ook 'n eier bak en op die burger sit. Gesond is altyd beter. En as jy iets wat eintlik nie so goed is vir jou darem 'n bietjie gesonder kan maak – hoekom dan nie? Veral as dit so lekker soos die is! 4 lang rolletjies – bruinbroodrolletjies pas baie goed by die gesonde tema! Sny tamatie in klein blokkies en gooi in 'n mengbak. Pak blaarslaai- en basiliekruidblare op 'n hopie en rol dun op. Sny nou van 'n kant af in dun repies. Gooi by die tamatie. Voeg ook die mayonnaise, tamatiesous, sout en peper by. As jy dit nie vars beskikbaar het nie, kan jy gedroogde basiliekruid ingooi. Proe of jy genoeg van alles in het. Verhit die worsies in 'n pot met water, of in die mikrogolfoond. Sit nou 'n worsie en slaai in elke broodjie. Hier kom jy nou by 'n vurk in die pad – erg tradisioneel sou sê dat jy al die bestanddele apart op die worsie in die broodjie sit, en ek sou sê dat dit lekker is om alles te verhit en te meng. Smeer met botter en mosterd. Sit ‘n worsie op elke sny brood en rol op. Rooster oor kole totdat die brood bros en bruin is. Hierdie is baie lekker vir die manne as hulle rugby kyk, of vir 'n lekker burgerbraai of vir die honger ouens op 'n kamp. En dalk sien vroutjie ook kans vir hierdie massiewe burger...hy's fantasies lekker. Maak wedges of chippies by as jy nog kans sien vir dit ook. Klomp gebraaide uieringe in bottter/olyfolie, sout, peper, tikseltjie suiker en balsamieseasyn, braai tot goudbruin of koop Spur se crispy uieringe. Sny pitas middeldeur en rooster snykante op die rooster of in oond tot lekker bruin. Bou nou jou hamburger soos jy van hom hou. Groter en lekkerder kan jy nie kry nie en honger na so een gaan jy beslis nie wees nie. Jy kan ook 'n gebakte eier of bacon opsit as jy so voel. Hierdie foto is net van 'n gewone pitaburger, sonder veel trimmings. Was lewertjies, verwyder vliesies en sny middeldeur. Rol in mengsel van meel, sout en peper en braai in 'n bietjie olie totdat lewertjies bruin is. Klits eier en pietersielie saam en voeg by lewertjies. Druk lewer in stukkies terwyl geroer word. Sny broodrolletjies middeldeur en skep op een helfte van elke rolletjie van die mengsel. Plaas tamatieskyfie bo-op en rooster paar minute totdat tamatie gaar is. Plaas ander helfte van rolletjie bo-op. Geen uitstappie is lekker sonder ‘n Bosveld Burger nie. botter. Geen borde of slaaie nie, dis verbode! Smeer die brood rolletjies vooraf. Braai dan die steaks oor vinnige kole, selfs so tussen die lamme deur. Seel die een kant goed, draai om en sout. Doen dan dieselfde met die ander kant. Probeer om die vleis so min as moontlik te draai. Haal die vleis af terwyl dit nog sag en buigsaam is, liewer te rou as te gaar. Plaas dit onmiddelik in die gebotterde rolletjies en eet dit staan, staan om die vuur. ‘n Skitterende afwisseling is ‘n Veld Hoender Burger. Vervang die rump steaks met dun gesnyde hoender filette. Braai net totdat die hoender gestol het en sy buigsaamheid verloor. Bedruip met een van jou gunsteling souse net voordat die hoender afgehaal word. Plaas dit onmiddelik in die gebotterde brood rolletjies en eet dit staan, staan om die vuur. Hierdie burgers is so lekker en sappig, iemand gaan weet dis nie vleis nie. 1. Kook die lensies (saggies) in effens gesoute water vir 20 minute. Dreineer. Vergruis die hawermout in 'n verwerker tot meel. 2. Kombineer die lensies met die knoffel, koljander, koemein en 3 eetlepels van die hawermoutmeel. Verpulp rofweg met 'n kapokaartappel spaan. Roer die eier daar-deur en geur met sout en peper. 3. Vorm 6 burgers met alles en poeier hulle goed met die oor-blywende meel. 4. Verkoel 20 minute lank in jou yskas. 5. Braai hulle in warm olie in 'n pan vir 3 tot 4 minute per kant. 6. Sit 'n slaaiblaar en 'n bietjie uie in elke pitabroodjie en glip 'n burger in elk. 7. Meng die jogurt en ment en bedruip die vleis mildelik daarmee. Vir minder moeite kan jy net een soort maalvleis vir die mengsel gebruik en die uie weglaat. Weg-leser Elmi Basson het ’n soortgelyke burger by ’n kosmark raakgeëet. Doen moeite om Raclette-kaas in die supermark op te spoor – dit smelt goed oor die warm burger en die ryk soet geur is onverbeterlik. 1.Braai die spekrepies in ’n lepel olyfolie in ’n vuurwarm pan tot dit bros is. Skep dit uit en meer die spek liggies met heuning of stroop. Vee dieselfde pan met kombuispapier uit en plaas die spek terug daarin om vir ’n paar sekondes te braai sodat die heuning of stroop kan karamelliseer. Hou dit eenkant. 2.Braai die uie in ’n skoon pan in ’n teelepel olyfolie tot dit deurskynend is. Meng dit dan by die res van die bestanddele vir die patties in ’n groot bak saam. Vorm 4-6 patties en verkoel dit totdat die vleis ferm is. 3.Smeer elke pattie goed met olyfolie en braai dit vir 3minute aan die een kant. Draai die burgers om en smeer die bokant goed met braaisous. Braai die ander kant ook vir 3 minute, draai dit om en smeer dit ook goed met braaisous. Verwyder dit van die hitte. 4.Neem ’n paar halwe kersietamaties en druk hulle effens sodat die sap op die gebotterde rolletjies uitloop. Sit dan die tamatiestukkies daarop neer. Skep die warm pattie bo-op die tamatie en sit dadelik ’n skyf kaas daarop sodat dit kan smelt oor die vleis. Bedruip dit met nog van die braaisous en sit dit voor met die spek. Vir variasie kan jy ’n hand vol gerasperde parmesaankaas by die vleismengsel meng. Jy kan ook dié vleismengsel vir klein frikkadelle gebruik wat jy saam met pasta en ’n tamatiesous voorsit. 1.Kap die chorizowors fyn en meng dit saam met al die ander pattie-bestanddele in ’n groot bak. Vorm 6 vleiskoekies met die hand. Sit dit in die yskas totdat die vleis ferm is. 2.Kap die avokadopeer grof en meng dit met die res van die guacamole-bestanddele. Moenie ’n gladde pappery maak nie; dit moet nog taamlik dik en stukkierig wees. 3.Smeer die patties goed met olyfolie en braai dit vir 2-3 minute. Draai dit om en smeer die bokant goed met braaisous. Braai die ander kant ook vir 2-3 minute, draai dit om en smeer die bokant goed met braaisous. Haal dit van die hitte af. 4.Sit dit voor met gebotterde sagte rolletjies en laat elkeen hulleself help met guacamole. As jy bang is die vleis brand swart, kan jy dit net halfpad braai en dan op ’n bakplaat pak. Druk die gaar wiggies, pitabrode en vleis dan net voor etenstyd vir ’n paar minute in ’n warm oond. Ek het eenkeer ’n pizza met net okkerneute, tiemie en feta daarop geëet, en dit was hemels! Die geure werk ook baie lekker met lamsvleis, veral as jy die slagter vra om vir jou ’n ontbeende Karoolamskouer grof te maal. 1.Meng die helfte van die neute en die helfte van die tiemie en hou dit eenkant. Meng die res van die tiemie en neute met al die bestanddele vir die vleis. Vorm 4 ewe groot patties en sit dit in die yskas totdat dit ferm is. 2.Verdeel die tiemie-en-neutmengsel in 4 en druk elk van die patties aan al twee kante daarin. 3.Verf die burgers goed met olyfolie en braai dit vir altesame 6 minute – draai dit elke minuut om sodat die neutmengsel nie aanbrand nie. Haal dit van die hitte af. 4.Maak die pitabrode oor die rooster warm en sit die vleis saam met tzatziki en olyfolieskyfies binne-in. ’n Maklike middagete vir bedrywige manne. Verhit olyfolie in diep pan. Voeg uie en knoffel by. Braai oor lae hitte tot net sag. Maak pan toe met deksel en laat smoor tot sag. Maak oop en verhoog hitte. Braai tot bruin. Geur met sout en peper. Bring water tot kookpunt in ’n groot kastrol. Draai hitte heeltemal af en gooi worsies in. Laat staan sowat 10 minute tot worsies warm is. Sny rolletjies halfpad oop. Plaas gerasperde kaas in. Plaas twee worse bo-op en smeer worse met mosterd. Skep gebraaide uie bo-op en eet onmiddellik. Moenie die worsies in water kook nie, want hulle sal maklik oopbars. Kook eers net die water en trek dan die kastrol van die hitte af voor jy die worsies insit. Maak kastrol toemet ’n deksel en laat staan so 10 minute. Sit warm worsies in hotdogs. HIER'S 'N "POPPERDOG" VIR DIEGENE WAT BAIE BRAAF IS, WANT HY GAAT JOU RERIG BYT, MAAR DIT LYK SO VREK LEKKER! Neem 'n hotdog bun, weense worsies, mosterd en 'n jalopino en kaas. Haal die binnegoed van die jalopino uit en sny in die helfte deur. Druk stukkies kaas en worsies daarin. Sit die hele gedoente nou in 'n halwe hotdog en gooi lekker mosterd bo-oor en wees braaf en hap daai hap. HEERLIKE SPEK EN KAAS HOT DOGS! Neem vieannas en draai dit toe met stukkie kaas en spekrepie. Steek vas met peuselstokkie, verf mildelik met gesmelte heuning en sojasous en braai op die rooster tot spek bros is. Smeer hot dogbroodjies met mosterd en botter en sit die worsie binne in. Baie lekker en iets anders as die gewone hot dog! Rol deeg dunnerig uit en sny repe so lank soos jou stukkie boerewors. Smeer deeg met dun lagie mosterd en tamatiesous. Rol stukkie wors hierin toe en sorg dat dit oral mooi toe is. Smeer elke brakkie met 'n "egg wash". Bak in voorafverhitte oond van 180 grade C tot gaar en mooi ligbruin. Jy kan ook hierdie by die kamp maak in toeknyprooster. 1. Braai ui tot deurskynend, voeg knoffel, sampioene en chillie by. Braai vir nog ‘n minuut. 2. Voeg room by, en laat dit “reduce”; meng mosterd in die mengsel en bedien warm bo-op jou Russian. Braai genoeg wors vir die aantal persone wat gaan saam eet. 3 -4 AVO's in skyfies gesny. Maak groot hoeveelheid bbq-sous of kry die gekoopte sous. Margarien indien jy broodrolletjies wil smeer. Bou dan jou worsrolletjie na jou smaak. Voorverhit die oond tot 180 °C. Rol die deeg uit op ’n oppervlak wat met meel bestrooi is. Sny die wors middeldeur sodat jy twee ewe groot stukke het. Sit die tweede stuk wors op en rol dit saam met die eerste een. Verf die bokant van die worsrol met die eier en bak dit 20-30 minute in die oond of tot die deeg goudbruin is. OF Kan ook in boodoond gemaak word of op toeknyprooster. Plaas die vleis in 'n bak. Voeg die peper, Worcestersous, Tabasco, mosterd, pietersielie, grasuie en tiemie by. Bedek en plaas in die koelkas. Net voor gebruik, druk in vier ovaalvormige hamburgers. Rooster die vleis op jou rooster. Plaas die tamatie in 'n voedselverwerker met sout na smaak, lemmetjiesap, ui, knoffel en rooi en groen soetrissies. Tol vir kort rukkies tot goed gemeng. Gooi in 'n bak en voeg die avokado by. Vou goed saam en eet binne 'n uur. Verhit die botter en olie in swartpot op warmkole en roerbraai die kerriepoeier vir sowat 1 minuut. Voeg die meel by en roerbraai sowat 2 minute. Voeg die uie by en braai tot bruin. Roer die asyn, vleisaftreksel, sout, appelkooskonfyt, suiker en piesang by en roer tot die suiker opgelos is. Bring tot kookpunt en laat prut vir 5 minute. Sny die broodjies oop en pak die slaaiblare op. Sit die vleiskoekies op en skep dan die sous oor. Heerlike.........beslis iets anders in 'n Hamburger! Meng al die bestanddele saam en vorm 10 maalvleisburgers. (62 ml) fyn klapper Dreineer appelkose en behou stroop. Kap appelkose met 'n mes in kleiner stukkies en meng met blatjang en klapper. Maak holte in elke burger, verdeel die appelkoosvulsel tussen die burgers en vul elkeen. Druk mooi toe aan alle kante en maak die burgers plat vir braai. Smeer kookolie aan albei kante van burgers en braai hulle op 'n rooster oor die kole aan albei kante tot gaar. Variation 1: Arrange a selection of lettuce leaves on a hotdog or other roll and put a piece of boerewors on top. Spoon a little braised onion and a few cherry tomato halves moistened with mustard vinaigrette on top. Braised onion: Slice 2 onions into rings and fry in a mixture of olive oil and butter until soft. Season with salt, freshly ground black pepper and a little sugar. Add 5 ml Dijon mustard, 30 ml balsamic vinegar and 15 ml honey. Simmer until all the liquid has evaporated. Extras: Baby marrow slices, marinated sun-dried tomatoes or marinated roasted brinjals; chopped spring onions and parsley mixed with chopped garlic and extra olive oil; and pitted black olives and crumbled feta cheese. Variation 2: Make hotdog rolls (panini, mini Portuguese rolls or ciabatta make a nice change) with braaied boerewors, rocket and a generous spoonful of tomato chilli jam. Extra: Mash avocado and mix with sour cream and a little lemon juice. Put the braaied boerewors in the bread rolls and serve with a generous spoonful of the avocado mixture and onion sprouts. • Koop `n paar hout besemstokke en saag ‘n paar 400 mm stukke daaruit. Maak die twee ente effe rond en glad. Vee skoon en seël een end met kookolie vir so 150 mm. 1. Sif meel, bakpoeier, sout en suiker saam. 2. Vryf die 4 eetl. botter in met vingerpunte tot krummelrig. 3. Giet die melk,eier en water daarby en meng tot `n stywe deeg. 5. Gebruik jou aasmes (skoongemaak) om die deeg in repe te sny – 25 mm wyd en 400 mm lank. Bedek met `n klam doek totdat die vuur reg is. 6. Rol die repe deeg om die ge-oliede punte van die stokke - die repe moet mekaar so 5 mm oorvleuel. Die lengte van die horingkies moet so lank wees soos die worsies wat jy gaan gebruik. 7. Maak die ente van die deeg nat en verseël op die deeg. 8. Braai op koelerige kole tot ligbruin, draai dikwels om. 9. Verroom die 2 eetlepels botter, meng tamatiesous en mosterd daarby. 10. Net voor die broodjie gaar is, kan die worsies eenkant verhit en dik gesmeer word met die bottermengsel. 11. Gly die broodjie van die stokkie af en steek `n worsie in, en siedaar `n welbeloontjie brak. Jy kan gekoopte deeg ook hiervoor gebruik. Maak die soja en Worcester sous liggies warm in die mikrogolf oond. Roer nou die suiker en heuning daarby in totdat dit opgelos is. Nou volg die res , behalwe die olie. Plaas nou die ontdooide borsies in plastiek bak wat lekker dig seël en bedek hulle met jou marinade. So kan jy hulle maklik omdop en verseker dat jou marinade sy werk doen. Binne ‘n uur is die geur al lekker ingetrek , maar ek laat hulle soms oornag in die yskas. Braai nou jou borsies oor warm kole en bedruip hulle met die olyf olie sodat dit so dan en wan kan opvlam … dis waar die smaak regtig inskop. Die basis van jou burger is die gebotterde broodjie , hierop plaas ek ‘n lagie gebraaide uie , die pattie natuurlik en vloeiende kaas daaroor. Nou kan jy al die kraak lekker gesonde goed bysit na jou eie smaak. We all know the best way to cook boerewors is over the coals, but no man can braai every night, well that’s according to my wife in any case. Anyone that have ever eaten a garage pie or rather a garage sausage roll have probably made a promise to themselves never to buy one again. If however you try these sausage rolls, you just might have sausage rolls on the menu very often. Slightly cook the boerewors; it should only start to change color. Roll out the puff pastry and divide into 6 equal pieces. Grate some cheddar over each piece. Add a piece of boerewors on top of each piece of dough. Cut cherry tomatoes in half and pack around the boerewors. Sprinkle some of the rosemary over the sausage. Mix the milk and the egg together. Brush the one edge of the dough with the egg and fold over. Brush the outside of the sausage roll with egg and sprinkle the rest of the rosemary on top and bake in a 180°C preheated oven until golden brown. Enjoy with a glass or two of red wine, and maybe even a side salad. Meng jou vleis, Pietersielie en uie goed saam met die hande. Maak die mengsel oop en voeg die speserye, sout en pepper egalig by en meng weer. Voeg die eiers by, geklitste eiers meng makliker en meng weer baie goed deur. Voeg nou die broodkrummels by en meng vir 'n laaste keer goed deur. Jou vleis behoort nou reg te wees om patties te maak. Ek het vir my 'n pattie maker by Boardrooms gekoop, lekker groot een wat baie vleis vat, so 2 cm dik en ek skat so om en by 200g in gewig per pattie. Die Tupperware patty maker werk ook. Wanneer jy by die slagter is, vra hom sommer vir so handvol van die plastiek sirkels wat mens tussen die patties plaas sodat dit nie aan mekaar klou nie. Jy moet hulle lekker styf saampers - gebruik maar spray en cook of olyfolie om te keer dat dit vassit. As jy nou al die patties gemaak het en mooi verpak het op 'n bord met die plastiek skyfies tussenin, dan sit jy dit in die yskas vir 'n uur om mooi te set voor jy braai. Hamburger buns, lekker groot, gesmeer en aan die binnekant vinnig gerooster op die kole. 2-3 groterige uie gesny in halwe ringe - braai die uie in 'n pan en karamaliseer dit met asyn en suiker, balsamic asyn werk die lekkerste. Dit mkoet mooi bruin gebraai wees - hou warm eenkant. 2-3 groterige tamaties in skywe gesny, genoeg vir almal. 1 bottel gerkins in dun skywe gesny genoeg vir die burgers. Jou gunsteling kaas in dun skywe gesny vir afronding. Nou kan jy begin om daai patties in 'n toeknyp rooster te spasieer en jou vuur moet nou al lekker warm wees. Die patties draai net soveel makliker met die rooster. Seel hulle mooi aan die eenkant vir so 3 minute en draai dan om - weer so drie minute. Sodra jy weer draai smeer jy jou steakhouse sousie op met 'n kwas en so hou jy aan tot die patties gaar is volgens jou smaak, nie te gaar nie anders is hulle te droog. Kry die mense bymekaar en pak julle burgers soos julle daarvan hou voor hulle koud word. Jy kan van dieselfde sous gebruik om ekstra oor jou burger te sit of 'n mayo sousie as jy dit verkies. TO DRINK: A pinotage rosé is light and quaffable with a juicy burger. 1.Prepare medium to hot coals if you are going to grill the burgers over the fire. 2.For the patties, soak the bread in yoghurt, mixing with a fork until it is completely fine. Add the mustard, garlic and lemon peel and mix through. Place the mince and feta in a big mixing bowl, add the bread mixture and mix with a fork. Season to taste. Be careful not to overmix the mince. 3.Shape the mince mixture into 6 palmsize patties. Refrigerate for 10 minutes. 4.For the chips, heat the oil to medium heat and add a small handful of chips. Fry in batches until soft. Remove from the oil and drain on paper towel. 5.Increase the heat of the oil to medium high and return the chips to the hot oil in batches. Fry each batch until golden and crispy. Drain on paper towel and sprinkle with salt flakes. 6.If you are grilling over the fire, rub olive oil over each patty and place directly over the fire. Wait for 6 – 8 minutes before turning to ensure that the patties do not break. 7.If you are pan-frying, heat 15ml (1 tbsp) olive oil in a frying pan and fry 3 of the patties for 7 minutes on both sides until golden and cooked through. Repeat with the rest of the patties. 8.Preheat the oven to 200°C. Place the vine tomatoes on a baking tray, drizzle with olive oil and season with salt. Roast in the oven until the tomatoes begin to blister, about 15 – 20 minutes. Set aside. 9.Assemble the burgers by placing the bottom half of the bread roll on a plate, layer with rocket, onion rings, a beef patty, roasted tomatoes and avocado. Finish with the top of the bread roll and serve with the crispy chips. I'm constantly looking for new ways to spice up my hamburgers -- both literally and figuratively. So you can imagine how much I like this recipe for surf and turf burgers, which combines literal spice with me...nu diversity. It's a pretty simple recipe, mostly burger and shrimp, but it's a great twist on a standby, with a spicy mayo that knocks it out of the park. Like most burgers, this story starts with, well, a burger. That's the turf part. Cook it up however you see fit -- rare, medium rare, medium, or well done if you're some kind of crazy person. Once the burger is done to perfection, surf a few shrimp onto the top. If you're really fancy, you can cook the shrimp and burger side-by-side simultaneously so that they come off the grill hot at the same time. Perfecto. The sauce is really what takes this simple burger variation over the edge. In a small cup, combine the mayo, cajun seasoning (I like Tony Cachere's Creole seasoning), hot sauce, and about a third of a small red onion, chopped up. You can use some extra hot sauce or spice if you'd like -- or even toss in some cayenne pepper if it's not spicy enough for you. The bite of the sauce brings the flavor of the shrimp and the burger together nicely. Put it all together and enjoy! Pork burger recipes are a great way to enjoy something a bit different with your grilling. Enjoy the sweet taste of apples with this delightful recipe. Try it today! 1.In skillet, melt butter substitute over medium heat. 2.Cook onion and apple for about four minutes, until softened. 3.Add half of the bread crumbs, water and mustard, and cook for one minute. Add half of the salt, pepper and sage. 4.Shape pork into 8 thin patties. 5.Mound apple mixture on top of four patties, leaving 1/2 inch border, cover with remaining patties, pressing firmly to seal in apple mixture. 6.Coat patties with remaining crumbs. 7.Place on greased grill over medium heat. Cook, turning once, for 16 to 20 minutes or until no longer pink. Sandwich in buns. Meng al die bestanddele en rol die hoenderborsies in die mengsel. Verhit die olie in ’n pan en braai die hoender tot gaar en goudbruin. Rasper die komkommer en roer die jogurt, knoffel, sout en peper by. Sny die broodrolletjies in die helfte deur en pak die blaarslaai, tamatie, avokadoskywe en hoenderborsies op die broodjie. Skep die tzatziki oor die hoender en sit voor saam met aartappelskyfies. 100g gemaalde sirloin beef per persoon. Meng die maalvleis in ’n bak met sout en peper. Vorm maalvleiskoekies en druk dit platterig. Braai die maalvleiskoekies op die rooster tot gaar/in ’n pan. Bou dan jou burger met die oorblywende bestanddele. Meng al die bestanddele vir die vleiskoekie in ’n groot mengbak. Verdeel die maalvleismengsel in vier en vorm elk in in ’n koekie. Gebruik ’n maatkoppie of metaalvormpie om ewe groot vleiskoekies te vorm. Verkoel. Verhit intussen die botter en sowat 15 ml van die olyfolie en braai die sampioene daarin tot sag. Smeer die broodrolletjies met ’n bietjie mayonnaise en rangskik die blaarslaai, sampioene, uie en tamaties bo-op. Verhit die res van die olie en braai die vleiskoekies tot medium gaar of na smaak. Plaas op ’n bakplaat. Sprinkel die kaas boop elke vleiskoekie en plaas onder die roosterelement tot die kaas net gesmelt is. Plaas dit op die broodrolletjies. Sit voor met agurkies en aartappelskyfies. If you’ve caught up with London’s The Meatwagon you may have noticed something different riding on its bacon cheeseburgers. In place of bacon rashers (strips) Yianni Papoutsis piggybacks his beef burgers with a griddle-fried patty of chopped boiled bacon. The bacon patty is positioned directly atop the beef patty, essentially creating a double burger with an even distribution of bacon flavour and fat in every bite. You may lose much of the bacon’s crispness, which is a bad thing, but through the mingling of matching minces the beef and pork become inseparable, which is a very good thing – at least until the greasy meats reach your stomach. The patty-backed bacon burger was made famous by Hodad’s Burgers, which opened right off San Diego’s Bacon Street (I kid you not) in 1969. Hodad’s simmers strips of American-style bacon (British streaky rashers) until they shred easily, drains and chops the boiled bacon and shapes the bits into a thin patties. Meatwagon appears to follow the same practice. Both sides of the patties are fried on the griddle under the weight of a bacon press or, in the home version, a spatula and a strong hand. Sny die spek in baie klein stukkies of gebruik die klaar gesnyde spek en meng dit met jou burger pattie vleis en braai dit dan net. Miskien nie dieselfde nie, maar gee beslis vir jou dieselfde lekker spek en kaas-burger. Not your usual kebabs, these hot dog kebabs are fun and colorful, and they taste great, too! You'll love the flavor-packed sauce over bitesized pieces of hot dogs, bell peppers, corn and onions for a sure-fire hit with the kids and everybody! 2. In a medium bowl, combine chili sauce, brown sugar, and mustard; mix well and set aside. 3. On each skewer, thread a piece of frank, corn, green pepper, onion, and red pepper; repeat 2 more times and end with an additional piece of frank. 4. Brush skewers with half the sauce then grill 4 to 5 minutes on medium heat. Brush with remaining sauce then turn kebabs and grill 4 to 5 more minutes, or until vegetables are tender and franks are heated through. I like to use quarter-pound kosher franks for this recipe because their size works well on the skewers and their taste teams perfectly with the zippy sauce. Combine burger ingredients in a large bowl. Divide mixture into four patties and dust with flour. Fry burgers until golden and cooked through. Serve on buns, with salad leaves, tomato and generous dollop of guacamole. Use chicken of lean beef mince in place of fish to make burgers. Hoendermaalvleis is besonder veelsydig en kan in baie verskillende disse omskep word, met hoenderburgers natuurlik boaan die lys. Die vetterigheid van streepspek gee die burger ‘n wonderlike geur. 1. Meng die hoendermaalvleis, broodkrummels, sprietuie, brandrissie, pietersielie en olyfolie in ‘n groot bak. Geur deeglik met sout en peper. 2. Maak jou hande nat en vorm dan 10 – 12 patties uit die vleismengsel. Draai ‘n reep streepspek om elke burgerpattie, en dan nog ‘n reep in ‘n ander rigting sodat dit ‘n kruis vorm. Steek vas met ‘n tandestokkie. 3. Spuit die rooster deeglik met kleefwerende kossproei. Braai oor ‘n mediumwarm gasvlam of kole vir sowat 8 minute aan ‘n kant. As die burgers aan die rooster vassit, is hulle nog nie reg om omgedraai te word nie. 4. Sit voor op hulle eie of saam met broodrolletjies, slaaiblare, skywe tamatie en skyfies agurkie. Lewer 4-6 burgers, na gelang van die grootte van die burgerpatties. 1.In a medium bowl, combine cornmeal, flour, salt, pepper, sugar and baking powder. Stir in eggs and milk. 2.Preheat oil in a deep saucepan over medium heat. Insert wooden skewers into frankfurters. Roll frankfurters in batter until well coated. 3.Fry 2 or 3 corn dogs at a time until lightly browned, about 3 minutes. Drain on paper towels. In a mixing bowl, combine flour, cornmeal, sugar, baking powder, salt and chili powder. In another bowl, beat the eggs with milk and the 1/4 cup of oil. Stir egg and milk mixture into dry ingredients and whisk together until batter is smooth. Heat oil in the deep fryer to 360°. Insert a wooden skewer or popsicle stick into each hot dog, to make a "handle" for the hot dogs. Holding the stick or skewer, dip each hot dog into batter, turning to coat thoroughly and evenly. Fry corn dogs in 2 or 3 batches, for about 3 to 5 minutes, or until golden brown. Drain on paper towels or heavy brown paper. Maak pattie en braai tot gaar. Rooster die buns tot ligbruin op rooster. Smeer nou die buns met mayo en ketchup op beide die helftes. Bou verder soos volg: onder bun, pattie, agurkies, uie, tamatie, slaai en dan weer bun. 1.Grill the jalapenos over medium-high heat until charred all over, about 6-8 minutes. 2.Place the peppers in a zip-lock bag or other sealable container, seal and let them cool until you can handle them, about 20 minutes. 4.Dice 2 of the jalapeno peppers and mix into the cream cheese. 5.Divide the beef into 8 equal portions, form into patties, place 1/4 of the cream cheese mixture on 4 of them, top with the free patties, pinch the sides closed to seal and form into patties again. 6.Season the patties with salt and pepper to taste and wrap each with 2 strips of bacon. 7.Brush the grill with oil and grill the burgers over medium-high heat until cooked, about 4-5 minutes per side, topping each patty with a slice of cheese after flipping. 8.Assembly the burgers and enjoy! 1. Mix the turkey, peanut sauce, green onions, cilantro, egg, and bread crumbs in a large bowl. 2. Form 4 patties and place on a broiling pan. 3. Broil until cooked, about 10-15 minutes flipping once in the middle. 4. Assemble the burger, pouring some peanut sauce onto the patty in the bun. Hand ete vir die somervakansie. Vir man en muis. 500g wildsmaalvleis, gemeng met 300g skaap-of varkmaalvleis. Meng die maalvleis, tiemie, neut, sout en peper. Meng die gebraaide ui by. Roer eier by. Vorm die maalvleismegsel in in 12 ronde hamburger vleiskoekies. As die vleismengselmoeilik hanteer, laat dit dit vir ‘n halfuur in die yskas. Bedek die vleiskoekies met gegeurde koekmeel en braai in verhitte botter en oliemengsel tot bruin en gaar. Gebruik ‘n gewone of interessante hamburger broodjie of pita brood. Smeer met koljander pesto, mayonnaise , maaskaas of olyfpesto. Pak ‘n toring met ees roketblare of slaaiblare, dan die warm vleiskoekie en rond die smaak en af met geroosterde rooi- en geel soetrissie ringe, ‘n wig of 2 camembert-of ander kaas. Sweet chilli sous of waarvoor jy lus is en wat lekker is. Jy kan ’n goeie hamburger-vleiskoekie (patty) op die kole of in ’n pan braai. Week die brood tot sag in die melk. Meng al die bestanddele goed saam. Vorm in vleiskoekies. Verhit die 15 ml sonneblomolie in ’n riffelpan en braai die vleiskoekies weerskante tot hoe gaar jy dit wil hê. Verhit die 30 ml sonneblomolie in ’n pan en braai die uie tot sag en bruin. Plaas ’n sny cheddarkaas bo-op elke burger en sit in ’n warm oond teen sowat 120 °C - net tot die kaas gesmelt het. Plaas ’n vleiskoekie op ’n oopgesnyde rolletjie en skep van die gebraaide uie bo-op. I’m not sure what to call this, so let’s call it a pilchard fish burger with apricot relish. Mix all the ingredients for the burger except the flour and the olive oil together, and form into 6 patties, dust with the flour and fry on medium heat in a little olive oil until nice and brown. Soften the onions, chili and yellow pepper in a little olive oil, when almost soft add the apricots, fry until the onions are soft and the apricots are heated and starting to become a little darker. Add the coriander and fry for another minute. Butter a bread roll, top with your favorite leaves, for me that will be rocket, then the fish burger, top with the relish, add a couple of potato wedges and enjoy. 1. Mix the lamb, onion, garlic, oregano, dill, mint, lemon zest, salt and pepper in a bowl. 2. Form Patties with the mixture. 3. Grill, broil or pan fry the patties. All of the flavours of a bacon double cheese burger in a grilled cheese sandwich with plenty of ooey gooey melted cheese! 1.Cook the bacon in a pan over medium heat, set aside on paper towels to drain reserving 1 teaspoon of grease in the pan and the rest elsewhere. 2.Add the onion and saute until tender, about 5-7 minutes. 3.Add the garlic and saute until fragrant, about a minute. 4.Add the ground beef and cook draining any grease when done. 5.Mix in the ketchup, mustard, worcestershire sauce, salt and pepper, simmer to reduce, remove from heat and set aside. 6.Heat a clean pan over medium heat. 7.Butter the outside side of each slice of bread, place one slice in a pan buttered side down, sprinkle on half of the cheese, then top with the the bacon, beef, lettuce, tomato and pickle followed by the remaining cheese and slice of bread, buttered side up. 8.Cook until golden brown on both sides and the cheese is melted, about 2-4 minutes per side. 1.Prepare herb mayonnaise (Step 2) and refrigerate for up to 1 day. 3.Preheat grill to medium-high (or see Stovetop Variation). 4.Combine mayonnaise, mustard, 1 tablespoon shallot and 1/2 teaspoon thyme in a small bowl. Set aside. 5.Place the remaining 4 tablespoons shallot, remaining 1 teaspoon thyme, chicken, ham, salt and pepper in a medium bowl. Gently combine without overmixing. Form into 4 patties, about 3/4 inch thick. 6.Oil the grill rack (see Tip). Grill the burgers, turning once, until an instant-read thermometer inserted in the center registers 165°F, 4 to 5 minutes per side. Top each burger with cheese and cook until melted, 1 to 2 minutes. 7.Assemble the burgers on toasted bread with the herb mayonnaise and spinach. Prepare herb mayonnaise (Step 2) and refrigerate for up to 1 day. Coat a nonstick pan, preferably cast-iron (or a grill pan), with cooking spray and heat over medium-high heat for 1 to 2 minutes. Add burgers, reduce heat to medium and cook, turning once, until an instant-read thermometer registers 155°F (for pork and bison) or 165° (for beef or chicken), 4 to 5 minutes per side. Jalapenos seem to be monstrous at the grocery store compared to their size from a few years back. I used this large size to my advantage, and was able to case a whole hot dog and some cheese inside a couple of cut jalapenos. The fun thing about this recipe is that you could make a whole dozen of them easily, pop em into a zip lock, and head out to your nearest B.Y.O.M. party (Bring Your Own Meat), camp fire, or other communal grilling situation. Make sure you grab the biggest jalapenos you can fine. Get extra just in case. Fist cut your dogs in half and put some cheese slices in the center. Hollow out the jalapenos and you're ready to go. It wasn't too hard to squeeze the dog in there. I lost some of the cheese while I was grilling this thing, but if I was paying attention and flipping it better, I wouldn't have lost as much. You have to cook it longer to make sure the pepper is blackened and tender not crunchy. If you succeed you end up with a super tasty twist on two summer classics! Jalapenos can vary on spice level, but if you get all the seeds out these shouldn't be too bad to eat. •Mix all balsalmic tomato ingredients together into a small roasting dish and roast for 25 minutes. •When tomatoes are done, fry your burgers, heat the rolls, and in a separate pan heat some olive oil. Season the potatoes and fry until golden. Drain on kitchen towel. •Now assemble burger: squirt garlic mayo on both sides of the ciabatta, top with cucumner slices, the burger, tomatoes, onions and feta. Serve sweet tatoes on the side. I personally prefer using sweet potatoes as it is higher in fibre and has a low GI. Succulent shrimp burgers with all of the flavours of pad Thai! 1.Mince 1/3 of the shrimp in a food processor along with the garlic, shallot, fish sauce, lime zest and cilantro. 2.Mix the minced shrimp into the chopped shrimp, form 4 patties and chill in the fridge for at least 30 minutes. 3.Oil your grill, heat to medium-high and cook the shrimp until pink, about 3-5 minutes per side. 4.Heat the coconut milk, tamarind, sugar, fish sauce and peanut butter over medium heat until the sugar and peanut butter melt and the sauce thickens a bit and set aside to cool. 5.Mix the bean sprouts, carrot, green onion and cilantro and toss in the pad thai sauce. 6.Place the shrimp patties in buns and top with the bean sprout mixture, chopped peanuts and crispy fried shallots. Braai 750gm maer maalvleis en ‘n medium gekapte ui tot vleis grys en los is. Voeg 1 blikkie Chakalaka en 1 blikkie Room van Tamatiesop, ‘n halwe koppie fyngemaakte Pampoen, ‘n knippie fyn Gemengde Speserye sout en peper na smaak by. Prut met die deksel op vir 10 minute. Prut dan verder met die deksel af vir nog 20 minute totdat die mengsel dik is. Indien nodig, voeg koekmeel bietjies bietjies by om mengsel dikker te maak. Die mengsel moet sag, maar nie loperig wees nie. Bedien op ‘n hamburger rolletjie met slaaiblare. Hamburger, Cheese, Onion, Bacon, and a Krispy Creme donut, glazed. :) Happiness is only a heart attack away. The chili recipe makes enough chili for 16-20 hot dogs, which may seem like a lot, but you're just getting a large spoonful with each dog. So, if you have fewer people to cook for, just use the leftover chili as a stand-alone-dish for later. If you're feeding more, just double the chili recipe. You'll be happy you made a big batch. A note on the hot dogs, get the best quality hot dog you can, we tend to look for kosher dogs. The hot dogs themselves only need to be grilled enough to be heated; they are already cooked when you take them out of the package. 1 Make the chili first. Fry the bacon over medium heat until it begins to get crispy, then add the chopped onions and fry over high heat, stirring often, until they begin to brown. Add in the ground beef and stir in well. Cook this, still over high heat and stirring occasionally, until the beef is browned. This will take a few minutes. When the beef is about halfway browned, toss in the chopped garlic and mix well. 2 Once the beef is well browned, add the tomato sauce, molasses and beef broth. Add all the spices except the cayenne and stir well. Bring to a simmer and taste. Add salt or the cayenne if it needs it. You can of course add much more cayenne or chili powder if you like things really spicy, but it’s best to taste first and then add more. 3 Let the chili cook on a gentle simmer for at least 30 minutes before you start grilling the hot dogs. You can cook it several hours if you want to, adding a little more beef broth here and there if the chili gets to dry. 4 Grill your hot dogs over medium heat until they get a light char. Grill the hot dog buns briefly if you want – no more than a minute, as they will burn fast. You can also paint the buns with vegetable oil or butter before grilling if you’d like. Koop jou gunsteling boerewors en verwyder die vleis uit die omhulsel. Voeg 1 kop gerasperde sterk cheddarkaas by asook 4 -5 gekapte peppadews. Meng goed deur, maar moenie te veel meng nie, want dit maak dat die vleiskoekie taai word. Maak vleiskoekies en plaas in yskas vir ongeveer ½ uur en braai dan oor die kole en maak jou boerie burger deur 'n slaaiblaar, tamatieskyfie en gesnyde argurkie bo-op te sit. Gebruik ook jou gunsteling sous, soos tamatiesous en mosterd of gekoopte sous vir jou burger. Hou maar die omo byderhand, want hierdie is beslis 'n "have a crush stain" gedoente en een is nooit genoeg nie! 1.Whisk soy sauce, wasabi powder and honey in a small bowl until smooth. Set aside. 2.With a large chef's knife, chop salmon using quick, even, straight-up-and-down motions (do not rock the knife through the fish or it will turn mushy). Continue chopping, rotating the knife, until you have a mass of roughly 1/4-inch pieces. Transfer to a large bowl. Add scallions, egg, ginger and oil; stir to combine. Form the mixture into 4 patties. The mixture will be moist and loose, but holds together nicely once the first side is cooked. 3.Coat a large nonstick skillet with cooking spray and heat over medium heat for 1 minute. Add the patties and cook for 4 minutes. Turn and continue to cook until firm and fragrant, about 3 minutes. Spoon the reserved wasabi glaze evenly over the burgers and cook for 15 seconds more. Serve immediately. To skin a salmon fillet: Place it on a clean cutting board, skin side down. Starting at the tail end, slip the blade of a long, sharp knife between the fish flesh and the skin, holding the skin down firmly with your other hand. Gently push the blade along at a 30 degree angle, separating the fillet from the skin without cutting through either. Or have your fishmonger do it for you. 2. Form 4 patties and place them on a broiling pan. 3. Broil until cooked, about 10-15 minutes. 1 tbsp of butter/grass fed ghee/bacon fat etc. 1.Preheat the oven to 400 degrees F. Line a baking dish (like this one) with parchment paper. 2.Sauté the onions over medium heat with some cooking fat, like butter,grass fed ghee etc. Sauté until translucent. Allow the onions to cool before adding them to the meat. 3.In a bowl, mix all of the ingredients including the cooked onions. Mix well enough to evenly distribute the spices. 4.Divide the meat into 6 portions. Using your hands, roll a portion into a ball and then indent the middle, and flatten slightly to form the appearance of a bagel. 5.Place the bagel looking meat in the dish and repeat with each of the portions of meat. 6.Bake for 40 minutes or until the meat is fully cooked. 7.Allow the meat bagels to cool. Slice the meat bagel just like a regular bagel. Fill the meat bagel with topping such as tomato slices, lettuce, onions etc. 1. Mix the turkey, egg, breadcrumbs and salsa verde in a bowl. 4. Place the cheese slices on the patties and broil until melted, about 1 minute. 5. Mix the avocado, mayonnaise and garlic and mash the avocado to the desired consistency. 6. Serve the burger in a bun with the avocado mayonnaise, cilantro and sliced green tomatoes. Burgers with all of the flavours of moussaka including grilled eggplant and seasoned patties topped with both a tomato sauce and a bechamel cheese sauce. Heat the oil in a pan over medium heat, add the onion and cook until tender, about 5-7 minutes. Add the pureed tomato, oregano, cinnamon, allspice, salt and pepper and simmer until it thickens, about 5 minutes. Melt the butter in a pan over medium heat and cook until it turns a light golden brown, about 2-3 minutes. Add the flour and simmer until it turns a light golden brown, about 2-3 minutes. Add the milk and simmer until it thickens, about 5 minutes. Season with nutmeg, cayenne, salt and pepper to taste. Mix the meat, onion, cinnamon, allspice, salt and pepper, form patties and grill or pan-fry over medium-high heat (or broil) until cooked, about 3-5 minutes per side. Brush the eggplant with oil and grill or pan-fry over medium-high heat (or broil) until tender, about 5 minutes. Lightly toast the buns, assemble the burgers with the eggplant, patties, tomato sauce and cheese sauce and enjoy! All of the flavours of buffalo chicken wings in burger form with a creamy and tangy blue cheese slaw. 1.Mix the chicken, carrot, celery, onion, blue cheese, hot sauce, salt and pepper and form into 4 patties. 2.Oil the grill, heat to medium high and cook the patties, about 4-5 minutes per side, basting with more hot sauce near the end and set aside. 3.Serve the buffalo chicken burgers in the buns along with the mixture of the slaw and blue cheese dressing. Feel free to add an egg and some breadcrumbs to the burgers. 1.Mince 1/3 of the shrimp in a food processor along with the garlic, ginger, teriyaki sauce, sesame oil and green onions. 2.Mix the minced shrimp into the chopped shrimp along with enough breadcrumbs that the mixture will hold together, form 4 patties and chill in the fridge for at least 30 minutes. 3.Oil your grill, heat to medium-high and cook until the shrimp turns pink, about 3-5 minutes per side. 4.Assemble the burgers and enjoy! Use your favourite teriyaki sauce instead of making your own. Berei ‘n direkte vuur voor. Sny die broodrolletjies middle deur en smeer beide kante met bloukaas sous. Braai die bees patties tot gaar en verwyder van die rooster. Smeer patties liggies met blatjang. Plaas blaarslaai en roketblare aan onderkant van broodrolletjie, plaas dan die pattie bo op, bedek met tamatie, nog roketblare en uie ringe. Plaas nou die boonste helfte van broodrolletjie op en geniet. Vir n variasie as bloukaas sous nie jou eerste keuse is nie vervang met sous van jou keuse. Vir kaasburger kan repies kaas bo-op bees burger gesit word sodra dit omgedraai is, braai vir die laaste 3 minute. Vir ‘n vegetariese opsie kan bees pattie met vegetariese pattie vervang word. Turn your next cookout into a fiesta with these easy Mexican‐style burgers! This great burger recipe gets its pizzazz from the salsa that's mixed in with the ground beef, and the result is a flavor‐packed surprise! 1. In a medium bowl, combine ground beef, salsa, and bread crumbs; mix well. Make 4 equal‐sized patties. 2. Heat a grill pan or barbecue grill to medium‐high heat. Grill burgers 3 to 4 minutes per side, or 3. Top each burger with a slice of cheese, place on buns, and serve. Want a little more south‐of‐the‐border flavor? Top each burger with a spoonful of fresh or prepared salsa, and you'll practically have everybody shouting, "Ole!" Share the secret of making a backyard burger worthy of the Hamburger Capital of the World: Akron, Ohio. Your family will beg you to make these juicy, oniony burgers again and again! 2. In a medium bowl, combine all ingredients; mix well. Divide mixture into 8 equal amounts and make 8 patties. 3. Grill patties 8 to 12 minutes, or until desired doneness, flipping them halfway through grilling. If you want to plan ahead, you can mix up this full recipe, make half the patties for tonight's dinner, and freeze the rest (uncooked) for no longer than 30 days (to keep their full flavor). Just thaw the patties overnight in the fridge and cook according to directions above. There's nothing like a New York City hot dog topped with the onion sauce you get from vendors at portable pushcarts. And now you can enjoy those mouthwatering flavors without leaving home. 2. Grill hot dogs 2 to 3 minutes per side, until skin starts to crack. Place in buns, top with Pushcart Onion Sauce and serve. 1. In a medium skillet, heat oil over medium heat; add onions and sauté until golden and limp, about 7 minutes. 2. Stir in ketchup then add cinnamon, chili powder, hot pepper sauce, and salt. Stir in water and bring mixture to a boil. 3. Reduce heat to low, and simmer, uncovered, about 10 minutes, or until heated through. This Bavarian combo has the comfort tastes many of us grew up on. Serve it as is or add a squiggle of your favorite mustard. Oh, don’t forget the dark beer to wash it down. 1. Puncture each bratwurst with a fork. 2. Drain sauerkraut, placing liquid in a large resealable plastic storage bag; add beer to bag. Add brats to bag, and seal. 3. Cover and store drained sauerkraut in refrigerator while brats marinate in refrigerator for 3 to 6 hours. 4. Grill, broil, or fry brats 10 to 15 minutes, or until no pink remains in center. Serve with drained sauerkraut on warmed hot dog buns. 1. Firstly, start with the onions. Heat about 2tbsn oil in a large pan and add the sliced onions. Gently fry for 5-10 minutes until the onions are soft and golden. Set aside. 2. For the tomato relish, add the chopped tomatoes, sugar, balsamic vinegar, salt & pepper to a small pot and allow to reduce on a medium heat for 5-10 minutes until it’s thickened slightly. 3. In South Africa, Boerewors is almost always braaied but you can also pan fry the sausage of your choice. Cook until it’s cooked through but still juicy. 4. Serve the boerewors in the fresh rolls with some wholegrain mustard, tomato relish and fried onions. Add some coleslaw on the side. Brown meat. Add prepared vegetables and cook until tender. Add the remaining ingredients, being sure to add the sugar before the vinegar. Simmer 20 minutes and serve on hamburger rolls. Bring the water, corn and salt to the boil. Add the maize meal and mix well. Turn the heat down and allow it to simmer for 30 minutes. Add the butter and mix through. Taste for seasoning. Lightly oil a 20 x 20 cm dish with some olive oil. Scrape the porridge into the dish and flatten with spoon. Set aside to firm up (about 45 minutes will do). Put the wine and chutney into a small pot and simmer for 10 minutes. Set aside. Mix the sausage meat, paprika, chilli and zest together. Make sure you mix well. Shape to form 4 x 100g patties. Place the meat patties on the fire and braai for about 10 minutes (see tips for braaiing below). Baste with basting sauce every time you turn around. Cook the green beans for 10 minutes and slice thinly. Mix with avocado, lime, chilli and salt. Taste for seasoning. Place the corn bun onto a plate or serving dish, add the patty and then add a dollop or two of guacamole. Sprinkle with chilli flakes and a few green beans. Tips for braaiing burgers over the coals You need hot coals. Braai for a total of 4-5 mins on each side for medium to well done patties. Prepare your favorite mac n’ cheese recipe, pour it into a baking dish, and then refrigerate until cold and set. Split the ground chuck into 4 equal portions. Spray a large 4inch round cookie cutter with Pam and place it on top of a piece of parchment paper, press 1 of the portions of ground beef into the cutter, pressing it in to compact it and slightly pushing it up the sides, so there’s a deep indentation. Place 1 slices of American cheese on top of the pressed meat. Next, using a 3inch round rookie cutter, cut the chilled mac n’ cheese into small rounds. Place the mac n’ cheese round into the indentation of the beef, on top of the American cheese slice. Gently push the compacted mac n’ cheese-ground meat out of the cookie cutter, making sure it stays together. Repeat the process with another portion of the ground beef, compacting it in and pushing it up the sides (this patty portion will not be filled, but will be used to seal the burger completely). Place this formed patty on top of the other mac n’ cheese filled patty and seal the meat on the sides, so it’s completely formed. Repeat with the other two portions of ground beef. You should have two huge stuffed burger patties. Season all sides with salt & pepper. Heat a cast iron skillet over medium-high heat and melt some butter in it until very hot. Fry the each burger and cook for 2-3 minutes on each side, or until the outsides are brown and crispy. Place them onto a baking sheet and bake them in a preheated 400-degree oven for 5-10 minutes until your preferred doneness. Let them rest slightly before you assemble the burgers. 2. For the Coca-Cola Caramelized Onions: In a large pan on medium heat sauté the onions in half the butter for 10 minutes. Stirring occasionally but not too much. Over stirring will not allow the onions to brown. When the onions have absorbed all the butter, add the remaining butter and sauté another 10 minutes, occasionally stirring. When the onions absorb the second round of butter or oil and they are brown and translucent, start deglazing with the Coke, using enough to cover the bottom of the pan in a thin layer. Keep stirring occasionally and repeat the deglazing process until the onions are completely brown and soft, and all of the coke has be absorbed. Keep warm until you are ready to use. 3. For the Thousand Island Sauce: Combine all of the ingredients in a small bowl and stir to combine. Season with salt & pepper to your taste. 4. For the Weaved Bacon Patties: Preheat the oven to 350 degrees and line a baking sheet with a Silpat. Cut strips of bacon in half and weave the bacon slices into a square patty. I did this similarly to how you would weave a lattice-topped piecrust. Just alternately overlap the slices of bacon with each other to form a square patty. Bake the weaved patties in the oven for 20 minutes, and then boost the heat up to 400 degrees and cook until the bacon slices are all crisp (this will depend on how thick your bacon is, mine took an extra 10-15 minutes). Set these aside until you are ready to use them. 5. Assembling the Burgers: Top each slice of buttered & toasted bun with a thick layer of Thousand Island Sauce. On the bottom slice of each bun, top the sauce with 1 slice of seasoned heirloom tomato and lettuce. Place one stuffed burger on top of the lettuce, spread with Coca-Cola Caramelized Onions, and then top with the other weaved bacon patty and finish with the top slice of the bun. Repeat the make the other burger. 6. Serve immediately with some French fries. Alles goed gemeng en net 1 Pattie gemaak van so 300 - 400 Gram. Toe die pattie in olie gebraai. Skep die helfte van die gebraaide uie op, en gooi so bietjie mostert oor. Gooi nou gerasperde kaas oor, haal dan die gaar pattie uit die pan....MET 2 spane...en plaas dit op die broodjie. Skep die orige helfte van die gebraaide uie oor die vleis, en gooi weer garasperde kaas oor. Nou kom daar "pienk" mayonaise ook oor. Bak nou 2 eiers, en sodra die eiers gaar is, skep dit bo-op die vleis. Nou weeg die hamburger amper 1 kilogram. "PLAK" nou die burger toe en sit dit in die oond wat vooraf verhit is tot 100Grade, net vir so 5 minute. Freeze 'em and braai 'em later. These burgers are delightfully healthy, yet simply delicious. •Drain chickpeas thoroughly and pulse in a food processor to roughly chop. •seasoning and pulse to combine. •Gently form mixture into patties about 10cm in diameter by 2-3cm thick. •Dust with a little fl our and fry for about 3-5 minutes, or until crispy and heated through. •Slice rolls in half and toast. •Place patties on roll bases and serve with sliced tomato, rocket and a dollop of chutney. Varkvleis hou die patties lekker sappig. MAAK SO:Meng al die bestanddele saam. Smeer jou hande met olyfolie. Verdeel die mengsel in 10 stukke en vorm patties so groot soos jou handpalm. Plaas die patties vir minstens 2 uur op ’n gesmeerde bakplaat in die yskas sodat die geur kan ontwikkel. Pers die gerasperde komkommer met jou hande saam oor die wasbak sodat al die oortollige sap afloop. Meng met die ander bestanddele en hou verkoel. Verf ’n braairooster goed met olyfolie. Braai patties so 10 minute oor warm kole tot gaar, maar nog lekker sappig. Pak intussen ’n paar slaaiblare, ’n lepel vol songedroogde tamatie, ’n skyf geroosterde eiervrug en ’n paar uieringetjies op elke bap. Plaas ’n warm patty bo-op, gevolg deur ’n lekker groot lepel vol tzatziki. Sit dadelik voor. Verhit die helfte van die olyfolie in ’n diep pan. Voeg uie en knoffel by en braai oor lae hitte. Dit gaan nogal ’n goeie halfuur neem. As die temperatuur van die plaat te hoog is, sal die uie brand en bitter wees. Roer so elke nou en dan. Verhit die res van die olyfolie in ’n ander pan en braai die tamaties tot net sag. Dié smoor is nie een van daardie resepte waar alles saam tot ’n sous kook nie. Wanneer uie bruin is en tamaties sag, geur dit met sout en peper. Meng die tamaties en uie saam. Intussen kan jy die wors in ’n pan braai. Ek gooi altyd sowat 60 ml water in die pan en begin die wors in die water braai. Teen die tyd dat die water weggekook is, is die wors byna gaar. Draai die wors om. Verhoog hitte en braai wors tot mooi bruin. Sny baguettes oop, smeer met botter, en sit stuk wors en bietjie smoor in elk. Sit voor saam met vars roket – dit gee ’n heerlike ekstra smaak. Hamburger buns soveel as jy nodig het. Braai die volgende in 'n pan. Geur met sout en enige speserye na eie smaak. Sny die hamburger rolletjies so kwart van bo af. Hol die rolletjies uit en skep gebraaide bestandele in die rolletjies. As daar min in 'n rolletjie geplaas word kan jy een hele eier in elke rolletjie breek anders klits jy so vier eiers saam en gooi dit bietjie bietjie in die rolletjies sodat die eier tussen die bacon en sampioene in loop. Sit gerasperde kaas bo op en plaas so 15 -20 min in 'n oond of weber totdat die eier gestol en gaar is. Die dekseltjies wat jy afgesny het kan met bietjie botter op saam in die weber getoast word en dan met konfyt genuttig word. So lyk dit net voor hy in die weber in gaan. Meng die maalvleis, uie,origanum, feta-kaas, peper en knoffel liggies met ‘n vurk. Vorm die burgers en verkoel in die yskas terwyl die sous voorberei word. Meng die jogurt, suurlemoensap, dille, kruisement, sout en peper in ‘n kleinerige bakkie saam. Rooster die burgers oor die kole of oondrooster onder ‘n voorverhitte element vir ± 7-10 minute per kant. ]’n Sous soos dié bring die vleis se smaak na vore. Kinders en grootmense hou ewe veel hiervan. Verhit die botter en olie in ’n swartpot op warm kole en roerbraai die kerriepoeier sowat 1 minuut. Voeg die meel by en roerbraai sowat2 minute. Voeg die uie by en braai tot goudbruin. Roer die witwynasyn, vleisaftreksel, sout, appelkooskonfyt, suiker en piesangs by en roer tot die suiker opgelos is. Bring tot kookpunt en laat sowat 5 minute prut. Sny die rolletjies oop en pak die blare op. Sit ’n hamburgerkoekie bo-op en skep die sous oor. Burgers is gewilde vakansiekos. Dié weergawe is effens anders, maar steeds maklik en vinnig. Voorverhit die oond tot 190 °C en voer ’n bakplaat met foelie uit. Spuit dit liggies met kleefwerende kossproei of smeer liggies met olie. Gebruik jou duim om die stingels van die sampioene af te knak. Kap die stingels van die sampioene baie fyn en gooi in ’n mengbak. Druk die vleis uit die worsderms en meng dit met die gekapte sampioene en salie. Geur met varsgemaalde swartpeper en ’n bietjie vars knoffel, indien verkies. Pak die sampioene met die stingelkante na bo op die bakplaat. Verdeel die vleismengsel in ses gelyke dele en skep op die sampioene. Versprei egalig oor sampioene. Oondrooster vir ongeveer 15 minute, tot die worsvleis en die sampioene gaar is. Meng intussen die sagte botter en mosterd. Sny die broodrolletjies oop en smeer met die mosterdbotter. Besprinkel die sampioene liggies met olyfolie en vars suurlemoensap en sit ’n warm sampioen op elke rolletjie. Sit slaaiblare bo-op en sit dadelik voor. Meng alles vir peri-peri-sous saam. Smeer rolletjies. Geur steaks met sout en peper en braai vinnig oor warm kole tot gaar. Sit slaaiblare op rolletjies, tamatie bo-op en warm steak heel bo. Bedruip met peri-perisous en sit voor. The thing to do with chicken breasts is braai them and make chicken burgers. You obviously need the breasts to be skinned and deboned; these are also known as chicken breast fillets. The typical chicken breast fillet is a bit lopsided with a bulky part and a thin point, so put the breast fillet on a chopping board and give it a few gentle whacks on the thick part with a meat tenderising mallet before the braai. This will make it uniform in thickness, which makes for easier braaing and will soften the meat for biting through when it’s on the burger. If you hit it too much, it will disintegrate, and you will be left with chicken mince. You don’t want that so do be gentle with the mallet. This is stating the obvious, but a chicken burger contains meat, salad, dairy and starch, so it really is a balanced meal all on its own. 1.Place each chicken breast fillet flat on a chopping board and lightly pound the thick side with a meat mallet, wine bottle, rolling pin, side of a meat cleaver or any other item of sufficient weight and size. You want the whole fillet more uniform in thickness and this step will make the meat easier to braai, better looking on your burger and softer to bite. 2.Spice each chicken fillet with salt and pepper or your favourite braai salt. Either brush each one with oil or simply pour a bit of oil into the bowl with them and toss the fillets around until all are coated. 3.Braai the meat for about 6–10 minutes until it is done. The nice thing about chicken breast fillets is that you can actually see the meat colour changing from raw to ready on the braai. 4.Assemble the burger: Buttered roll, chicken breast, cheese, peri-peri sauce, mayonnaise, tomato and lettuce leaf. When assembling burgers I always like to place the cheese right next to the patty so that the heat of the meat can melt the cheese. Parboil potatoes in salted water until just soft, but not too soft: a fork should just be able to go in – this will take about 20 minutes. Drain very well, i.e. get all the water off. Cut into wedges, toss around in olive oil, and generously sprinkle the wedges with coarse sea salt. Bake in an oven pre-heated to 200C until brown and crispy – this will take about 25 minutes. Serve with your chicken burgers. 1.Heat oven to 425 degrees F. Place the bacon on a baking sheet and bake until crispy, about 10 minutes. 2.Place the butter in a saute pan over medium heat. Add the mushrooms and onions and saute until caramelized, about 10 minutes. Remove from heat. 3.Make 4 patties out of the ground beef. 4.Heat a griddle to medium heat and place the patties on the hot surface. Season with salt and pepper. Cook until edges are cooked. Flip and cook another few minutes, until the burgers are done throughout. 5.To assemble the burger, place the bottom half of bun on a plate. Add mayo, mustard, or other condiments. Place a burger, top with cheese, then another burger and cheese. Top with bacon and sauteed veggies. Place the top of the bun on the burger. Braai die spek in jou mikrogolf tot crispy, dis baie vinniger. This is a revolutionary burger: it’s the vegetarian meal that meat-eaters love. Jan Braai says he likes to make them using ‘those normal supermarket hamburger rolls with no substance,’ as it keeps the focus on the mushroom. This is a perfect braai solution for vegetarians. 1.Mix the garlic and butter. Mix in parsley. 2.Slice the rolls and spread cream cheese onto the bottom half of each roll. 3.Braai the mushrooms on medium to hot coals until nicely browned and fairly soft, for a total of about 6 to 8 minutes. For the first 3 minutes, braai them right-side up (with the black side facing downwards). Then flip them upside down (with the white side facing downwards), scoop a bit of garlic butter into each cup and braai until soft. They turn quite easily and if you’re gentle they won’t fall apart, so either an open or hinged grid is fine. 4.Put one mushroom on each prepared roll and crumble feta cheese over. 5.The burgers can be eaten immediately. Juices from the mushrooms will seep into the roll as you eat. 1.Cook hot dogs according to package directions and toast hot dog buns if desired. 2.Heat nacho cheese dip according to package directions. 3.Place hot dogs in buns. Top layer with nacho cheese, guacamole, chopped onion, jalapeno slices and salsa. Did I ever mention that I LOVE veggie burgers? Oh wait only a hundred times. This little beauty of a burger came about because I wanted to do something different to show how versatile a burger can be. I went through ideas of spinach burger, carrot burger, black bean chilli burger and decided on beetroot burger! I like beetroot but I don’t love beetroot so I wanted to try and balance out the earthy flavours with something a bit sweeter (so I added feta); I also wanted to give it a twist so I used chickpeas instead of my usual beans and I added some curry paste. The first time I made these I added toasted spices but the flavour was so harsh against the beetroot so I found that using a paste gave it a more mellow taste. It may sound like a mish mash but I can promise you that this is a tasty little burger! Mash the chickpeas in a bowl untill broken down but don’t mash them untill smooth! Grate the beetroot into the bowl (this is a messy part as fingers and worktops begin to turn pink!) and add the finely sliced red onion, the breadcrumbs, the egg and the curry paste. Stir all these ingredients together to combine. Crumble the feta into the bowl in quite large chunks and gently fold the cheese into the mixture. Mould the mixture into 4 patties and then put them on a plate in the fridge for at least 20-30 minutes. This will firm them up before cooking. In a pan heat some oil (use spray oil if being healthy) and then fry the burgers for about 3-4 minutes on each side. Serve with a burger bun and salad…and even some chips yum! I love Home made hamburgers and will much rather make one than buy one. hamburger patties and Portobello mushrooms, they just tastes so much better done this way and how lovely it was to enjoy the winter sun after being cooped up inside the house most of the winter. I’ve baked my own brown bread rolls for this burger but certainly won’t do that again as the bread was too dense to enjoy the burger filling. For a vegetarian version ditch the patty. In a food processor, finely chop the onion and chillie, add bacon. Mix with the rest of ingredients. Roll into balls, press flat and shape to form patties. Pop into the freezer for +- 15 minutes, grill. Grill Portobello mushroom brushed with melted garlic butter. Mash the avocado and mix in the rest of the ingredients. Assemble Hamburger and garnish with fresh lettuce leaves. Hamburgers are a popular meal with all the family, so I sometimes wonder why we don't make them more often. They're hearty, healthy and full of flavour and above all, so quick to make! Try this simple burger the kids will just love and don't forget, they taste great with a ring of pineapple as well. 1.Place beef mince, onion, tomato ketchup, Worcestershire sauce and egg in a bowl and season to taste. Mix until well combined. Divide mixture into 4 portions and shape into large patties about 1cm thick. 2.Heat a large non-stick frying pan or barbecue plate and lightly spray with oil. Sauté onion for 5 minutes tossing frequently until lightly browned. Set aside. Meanwhile, spray burger patties lightly with oil and cook over medium high heat for 3 minutes each side. 3.Assemble burgers by placing a lettuce leaf on the base of each toasted bun. Top with a beef patty, 2 slices of tomato, 2 slices of GOLDEN CIRCLE sliced beetroot caramelized onion and finish with a dollop of mayonnaise. Replace bun lid and serve immediately. 1.Preheat a grill to medium-high heat. 2.In a large bowl, mix ground beef with salt and pepper, then form into 4 patties. 3.Lightly oil the grilling surface. Cook burgers to your preferred level of doneness, several minutes on each side. Carefully grill the onion slices on each side until they're charred and tender-crisp. Toast the buns lightly on the grill. 4.Assemble burgers with grilled onions, beets, fried eggs, lettuce, tomato and desired sauce. 1. Thinly slice your onions. 2. In a large saute pan melt your butter over medium high heat. 3. Add your onions to the pan and stir them around a bit so that the butter can be distributed throughout. 4. Cover the pan, with the lid placed at an angle so that some of the steam can escape. Stir the onions every few minutes while they continue to cook.You are looking for a nice golden color to appear. Plan on them cooking for about 15 minutes. 5. While your onions cook toss your ground beef into a large bowl. Pour both packages of Onion Soup Mix over the beef. 6. Shake a little Worcestershire sauce into the bowl. 7. Crack a couple of eggs into the beef and sprinkle in a bit of salt and pepper. 8. Stick your hands right into the meat and mix it up thoroughly. Form 8 beef patties, fire up your grill and cook them to your liking. 9. While your beef is grilling, mix the water and bullion together and pour it over your golden onions. Turn up the heat to high and let the onions simmer in the liquid until most of it has been cooked out...remove the pan from the heat. 10. Stir in the sour cream. Mix until combined. 11. When your burgers are almost done grilling place the cheese on top to melt. 12. Build your burger! Bun, mayo, BBQ sauce, caramelized onions, pickle, chips (just do it, it makes all the difference....) and beef. Don't forget the beef. Here’s a great big burger recipe to try at the next braai. Great combination of flavours to pair excellent with a glass of Rib Shack Red. Combine the meat, onion and parsley in a mixing bowl and mix together well. Once properly mixed, spread the mix out in the bowl so you can get salt and pepper spread out evenly. Lightly beat the eggs and add to the mixture. Mix until the egg is incorporated, then add the breadcrumbs and mix again. Next, make the patties. You can use a patty press as the patties end up a bit sturdier and do not fall apart so easily. When you are done, put them in the fridge for a while to set. Toast the rolls in the oven to crisp them up a bit, otherwise they might lap up too much of the juices and become soggy. Just cut them open and pop them under the grill for a while until they are lightly brown. Slice the tomatoes (always sprinkle tomatoes with a bit of salt, it brings out their sweetness), slice the cheese and wash the leaves. Braai the patties over a medium high heat. About 4 minutes before they reach your desired level of “doneness”, give them a dash of basting sauce and spread with a brush. Once finished cooking, assemble the burgers. If you’re gonna braai a burger, why not do it properly. Here’s a fantastic everything on it, ultimate hamburger recipe. Looks great, tastes great and perfect with a glass of Rib Shack Red. Place the patties in the fridge to rest for a couple of hours: the flavours will develop and it will be less likely to break while cooking. Brush the patties with oil and braai until cooked through. Halve bread or bread rolls of choice, brush with olive oil and toast lightly. Arrange salad leaves and garnishes of your choice and patties on bottom halves of rolls. Top with fried free-range egg and crispy bacon, a slab of cheddar garnished with pickled gherkin, or tomato and onion monkey gland sauce and deep fried onion rings. We all loved this meal. I added caramelized onions to our grilled cheese and the kids could have theirs dipped in ketchup or tomato soup. I tried to keep the number of pans to a minimum by cooking everything in one skillet which made me even happier when it came time to wash dishes. 1.In a medium bowl mix ground beef, Worcestershire sauce, garlic powder, onion powder, bread crumbs and egg until well combined. Set bowl in refrigerator until ready to use. 2.Fry bacon strips in a skillet over medium low heat until crispy. Lay bacon on a paper towel to soak up remaining grease. Drain most of the grease from pan and set aside leaving about 2 TBSP in the pan. 3.Add onions to 2 TBSP bacon grease over medium-low heat to skillet. Allow onions to slowly cook until lightly browned and transparent. Remove onions from pan and set aside. 4.Remove ground beef mix from refrigerator. Break the ground beef mix into 4 equal portions. Form each portion into a thin, square patty. 5.Wipe out skillet with a paper towel and add 3 TBSP of bacon grease to your skillet. Over medium heat cook the 4 hamburgers until cooked through. Remove hamburgers from skillet when cooked and set on a plate lined with paper towels to soak up any extra grease. 6.Let skillet cool a bit then wipe out with paper towels. 7.Take one slice of bread, butter one side liberally and place butter side down in the skillet. Add 1/4 of each of ingredients cheddar cheese, then bacon, then hamburger patty, then onions then mozzarella cheese to top of patty. Take a second slice of bread and add it to the top of the sandwich. Butter the top side liberally. 8.Repeat step 7 for each sandwich. 9.Once all sandwiches are made place skillet on stove over medium-low heat. Once sandwiches are browned on the bottom and cheese has started to melt, 8-10 minutes, lightly press down on the sandwich with the back of a spatula before attempting to flip it. Try to do it in one swift motion so that the sandwich doesn’t slide. 10.Cook on the second side until well browned. Try to flip the sandwich only once during cooking. This will allow it to get crispy on the outside and melt the cheese on the inside. 11.When second side is browned remove sandwich from the pan and allow to rest 2-3 minutes before slicing in half. Fuse two of your favourite breakfast foods together to make a hearty, gut-busting dinner with the double bacon waffle burger. This beef sandwich is absurd, bacon-filled and delicious. Thin waffle patties are made using a simple Belgian waffle recipe; the only difference however, is that you must add salt and pepper to lessen the sweetness in the pastry. Then you fry up some square beef patties and pile them up high, adding cheese in between them. Let your cheese melt and then add your fried bacon onto the top of the dish before you mount it onto your pastry buns. Shock your taste buds by dressing your double bacon waffle burger with maple syrup. Your fingers will surely be a sticky mess once you're done gobbling down this sweet and salty find. The eggs benedict burger is a mash-up meal made in foodie heaven. What better way to start your morning off than with breakfast served in a meaty sandwich? Created by the masterminds of Dude Foods, this tasty sandwich combines all the best parts of these two meals. Sandwiched between a warm English muffin, the burger patty is topped with a perfectly poached egg and a drizzle of creamy Hollandaise sauce. Take this breakfast burger up a notch with a few slices of bacon and a sprinkle of fresh chives. You can also add a classy twist with some smoked salmon or tangy red onions. If you thought the Egg McMuffin was heaven in a bun, feast your eyes on the oozing and delectable eggs benedict burger. It perhaps sounds more appetizing than it really is, the Cinnaburger is not a dessert fashioned in the style of a burger but rather a hollowed-out cinnamon bun stuffed with ground beef and bacon. While the concept is fairly straightforward -- combine dinner and dessert into one main course -- the product of this pairing may be the result of a premature heart attack. Created by Nick of DudeFoods, the pairing of ground beef with sugary cinnamon goodness is apparently quite delicious. Similar to the creations by the team at Epic Meal Time, the burger/dessert hybrid packs a whopping calorie count bound to send one's blood sugar through the roof. However it should be stated that everything in moderation is a healthy approach. One Cinnaburger can't hurt can it? If you love to try gourmet burgers, this spaghetti burger comes sandwiched between two bundles of fried spaghetti noodles. A decadent burger combination to say the least, this burger takes spaghetti dinners and presents them in a whole new way. Created by American burger joint PYT, this spaghetti burger omits the traditional garlic burger bun for a crispy cluster of fried spaghetti noodles. Inside, a juicy beef patty is topped with garlic, Parmesan cheese and a healthy serving of homemade tomato spaghetti sauce. With the crunchiness of the noodle bun, this burger is definitely one messy meal to eat. With each bite, I can only imagine that the noodle bun would begin to fall apart sending delicious amounts of sauce dripping down your fingers. If you're up for the challenge, the spaghetti burger is a fresh way to eat some pasta. 1 Plaas die ribbetjies in ’n bak sout kookwater om die vleis te help versag. 2 Meng die oorblywende bestanddele in ’n bak. Sny die ribbetjies in vier ewe groot porsies, plaas in die bak en marineer ’n uur. 3 Voorverhit die oond tot 180 °C. 4 Verplaas die ribbetjies na ’n gesmeerde en gevoerde bakplaat en bak ’n driekwartier terwyl jy die vleis elke kwartier met die marinade bedruip. 5 Sit die ribbetjies op broodrolletjies voor met garnering van jou keuse (slaaiblare, tamaties, agurkies en/of uie) en bros skyfies. •Heat oil in a heavy-bottom pot. Add the onion, chilli flakes, cumin, thyme and season. SauteÌ until softened and onions are slightly golden in colour, then stir through the tomato paste and cook for another minute. •Add the mince and garlic and fry for a few minutes before adding canned tomatoes, sugar, beef stock and red wine vinegar. Simmer for about 30 minutes, then remove from the heat. •Heat a griddle pan and fry sausages until golden and cooked through (about 1 – 2 minutes on both sides). •Slice rolls in half, brush with a little olive oil, rub with garlic clove and place on the same griddle pan to toast slightly. •Mix the fresh chopped tomato, cucumber, a splash of olive oil, lemon juice and basil together. Season to taste. •Spoon chilli mince onto the rolls, top with a sausage on each and finish with salsa. 1.Place the chopped onions, coriander and KOO Baked Beans in a bowl and mash up together until the beans are well broken up. 2.Add the lemon rind, grated potato, beaten egg and mix. 4.Stir in the corn starch and breadcrumbs until it has a thick consistency. 5.Shape the mixture into patties, dust the patties with flour and place in the fridge for an hour to stop them from falling apart. 6.Heat some oil in a pan and fry the patties until they are cooked through and golden-brown. 7.Serve the patties on bread rolls with salad and your favourite sauces. Put the garlic cloves in a food processor and pulse until minced. Add the ginger, green onions, oil, fish sauce, chili sauce, and peanut butter and give them a whirl until they are well-combined. In a large bowl, combine the pork and the sauce mix. Work everything together with your hands. Form the meat mixture into 6 to 8 1/2 inch thick patties. Stash in the fridge so all of the ingredients can mingle and the burgers stiffen up a little. Set your grill up for a direct cook over high (450°F) heat. Grill burgers about 5 minutes per side, or until the meat hits 160°F internal. Remove from grill and let rest 5 minutes before serving. Top with a dollop of sesame mayo if desired. My own version of the burger is very close to skinless boerewors, and does not contain anything but meat and spices. I prefer to cook mine on either the coals or gas braai, for a quick lunch the gas braai is perfect. Brush the patties with the BBQ/Olive oil mix before putting them on the grill, and do so every time you turn them. I prefer mine medium, and when I turn the patties the last time, I add slices of cheese on top of the patties and close the lid of the braai to allow the cheese to melt. Once the patties are done, all that is left to do, is to butter a hamburger roll, add some sliced tomato, pickles and lettuce and then add a patty on top and enjoy. 1.Hoender Kap die hoender effens platter en geur met die sout en peper. Meng die pietersielie, suurlemoenskil, knoffel en olie en smeer oor die hoender. 2.Verhit ’n braaipan en braai die hoender in sarsies tot goudbruin. Pak op ’n bakplaat en braai 10 min. in die oond tot gaar. 3.Burgers Halveer die broodrolletjies en smeer albei kante met die mayonnaise. Pak die slaaiblare op die een helfte van elke broodjie. Pak die hoenderfilette op die blare. Sny die appels in skyfies en pak op die hoender. Sit die ander helftes van die broodjies bo-op. Sit voor saam met aartappelskyfies. Meng al die speserye saam met maalvleis , knoffel en fyn ui mooi deur, vorm 4 gelyke bolletjies, op kleefplastiek of oopgesnyde broodsakkie druk rondel bal versigtig plat vir pattie se vorm. Sit eenkant van die kleefplastiek oor die pattie en vryf en seel, en vorm hom mooi met jou hande, probeer die lug uitdruk. Sit in vriekas vir mistens 30 min, voor jy hulle panbraai. Maak sousie van gelyke dele blatjang, mosterdsous en tamatiesous gemeng. Rooster jou rolletjies, smeer goed met sous …. en …. bou nou jou hamburger, laat die sousies loop geniet !! Very simple. Just cook the sausage like u normally do. Place it in a bun and I in a oven proof dish. Top it with tomato relish. For mine I pan fry my onions till opaque. Then add in the tomato's. I normally take out the pips as it makes the mixture runny and the bun then goes soggy. With the onion mix I add a stock cube, mixed herbs and a tiny sprinkle of sugar to brake the tartness. Grate over a easy melting cheese and bake @180 Degrees till melted. The chicken sausage is already seasoned so you don’t need to go overboard on herbs and spices. Make sure the frozen pastry is properly thawed before you start. 1.Remove the chicken from the sausage casing and mix with ham and thyme. Divide the mixture into 6 sausages. 2.Roll open the pastry and cut it into three wide strips. Then slice the strips in half down the middle so you end up with six rectangles of pastry. 3.Spread each pastry rectangle with a teaspoon of chutney. Put a sausage on each rectangle and roll the pastry around it. Close the ends on each side. 4.Grease the griddle (flat-side up) and arrange the rolls seam down. Put on the lid and bake for 20 minutes, turning the sausage rolls every 5 minutes so that all sides are nicely browned. Make sure the braaier is not too hot – three briquettes should do the trick. 5.Serve hot with extra chutney and a salad or take them along as padkos. 1.Cook your boerewors over a BBQ until brown and cooked all the way through, or pan fry if you don’t have a BBQ. 2.Grate an apple, finely chop an onion, crush garlic cloves, finely chop the tomato and fry in olive oil. Add ½ tablespoon of sugar and Worcestershire sauce to the mixture. Flavor with salt and pepper. Cook until the onion is cooked and you have a thick sauce. 3.Butter bread rolls, place boerewors in each and add the sauce on top or on the side! 4.Can be served with homemade onion rings or any sides….